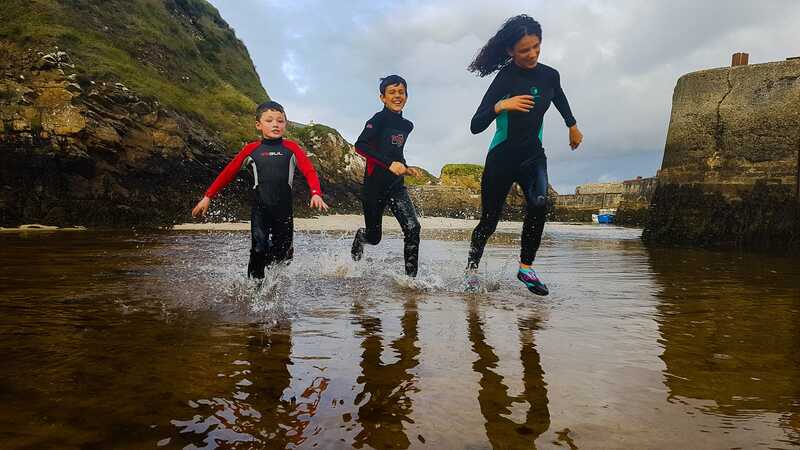 This year I took most of August off work and spent it with my family in Wales, Wiltshire and the Western Isles – it was a busy time but my camera was never far away. 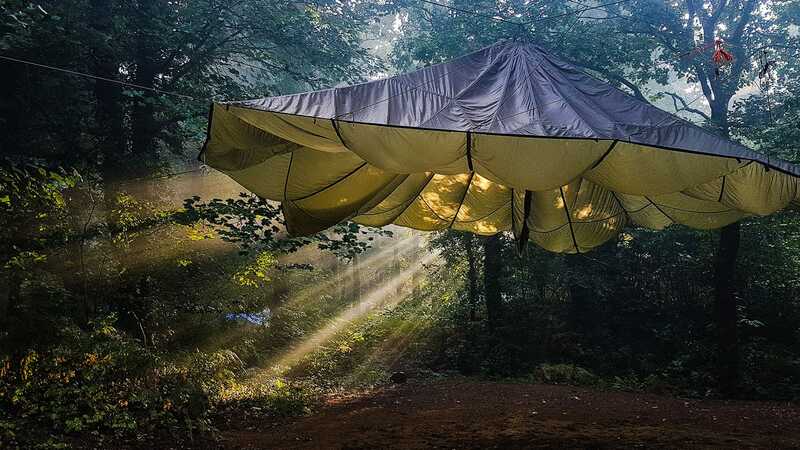 I set up this parachute at the BCUK Bushmoot as an extra classroom – it was located in front of my tipi and as I got up one morning I was presented with this wonderful view. 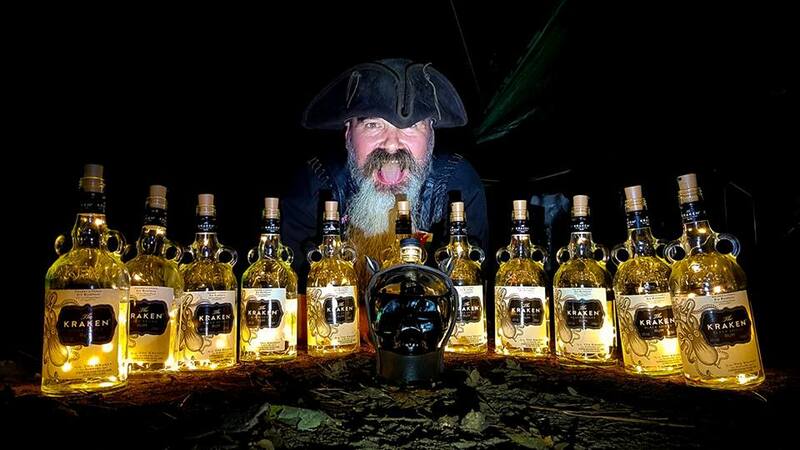 You have my thanks Cap’n for maintaining this tradition. 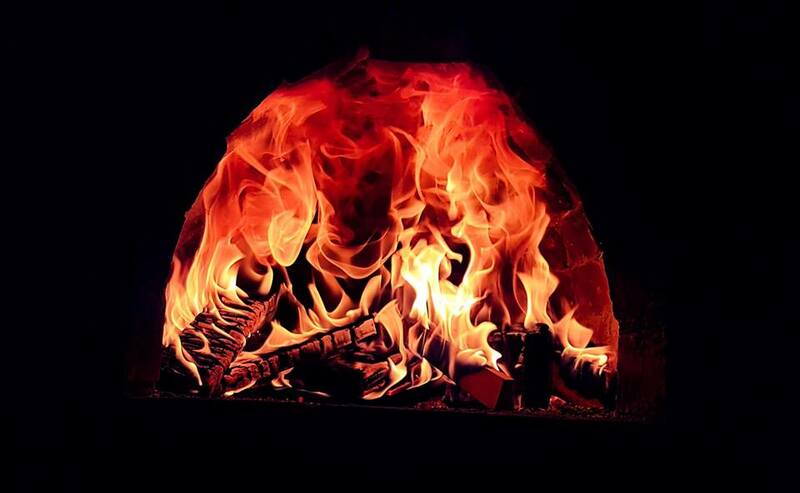 Never one to let a good fire go unnoticed the pizza oven at the Bushmoot gave me this cracking Demon Fire Face this year – you can even see its right arm. 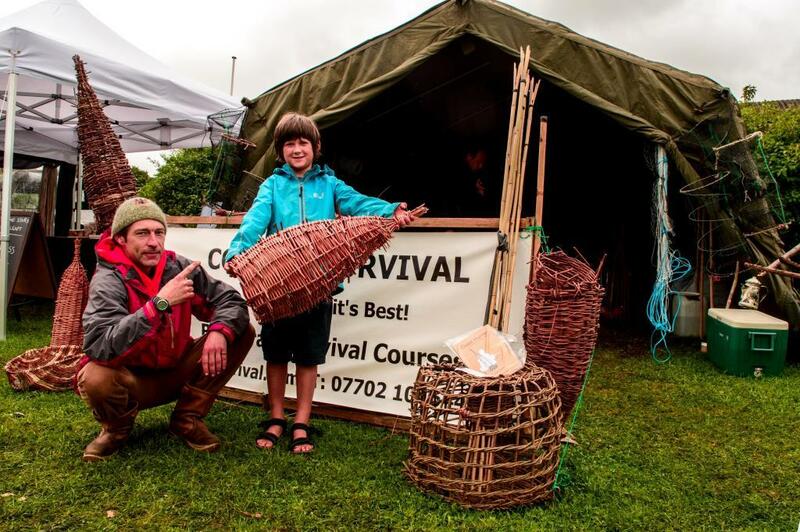 In the middle of August I spent five days with my lad Finlay at the Wilderness Gathering working with my friend Fraser and the Coastal Survival Crew. 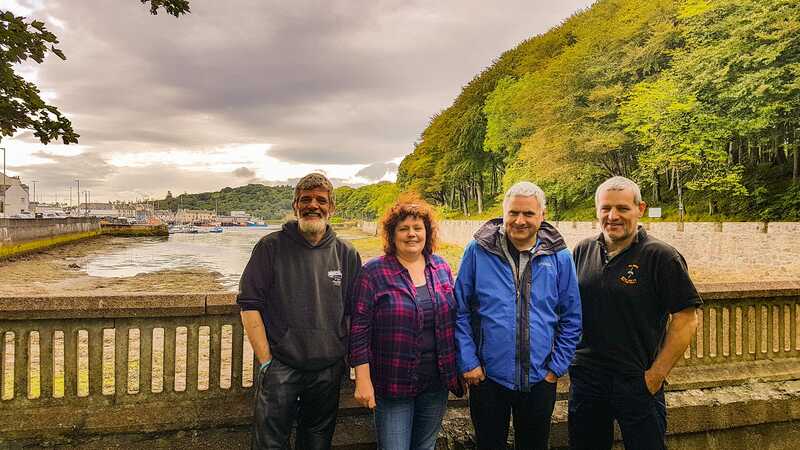 As a land lubber I have no idea why they keep asking me back each year but I am not going to say no – they are a great crew to work with. 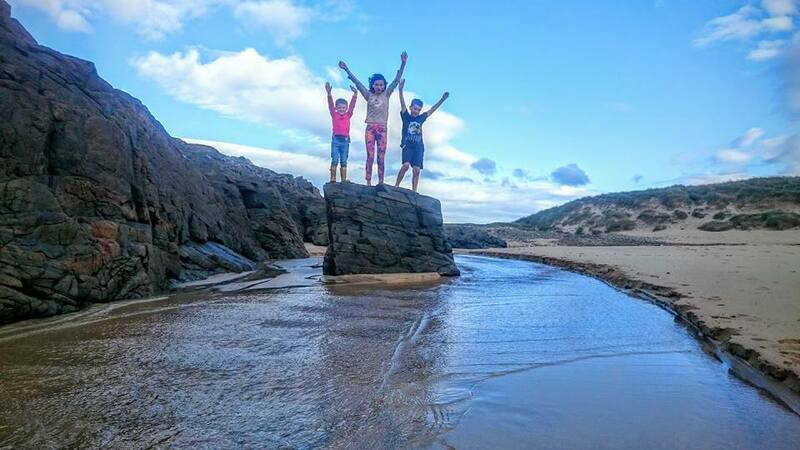 The latter half of August found me with the family up on the Isle of Lewis – I ran free on the beaches there as a kid and it is great to see my kids and their cousins doing the same. 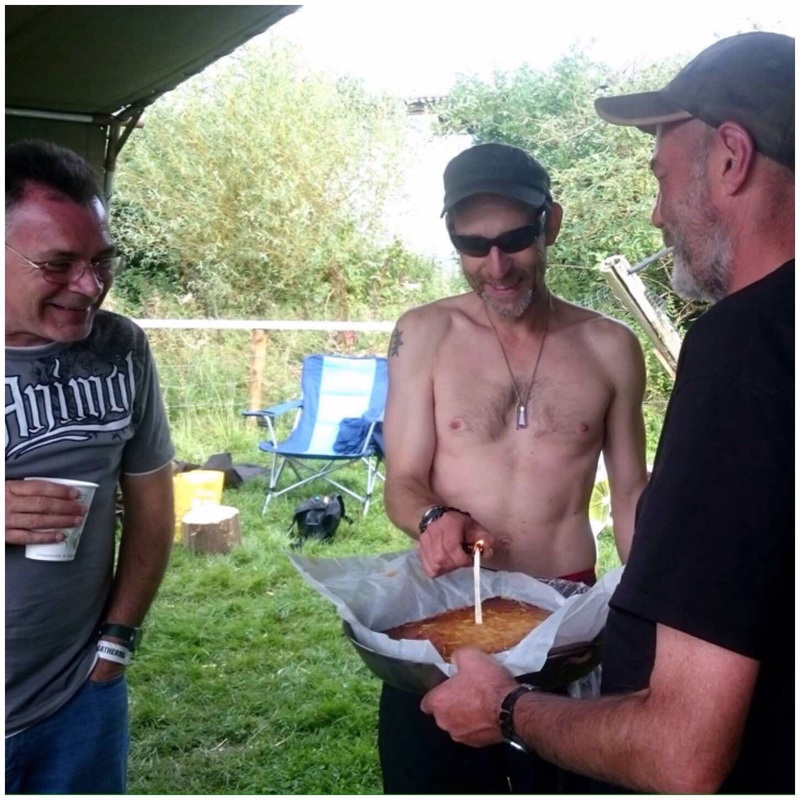 I do not get to Lewis that often and rarely when all my brothers and sister are there at the same time – this year they were all there and I made sure I got this picture (thank you Alison for taking it) – as rare as ‘Rocking Horse Poo’ you could say. 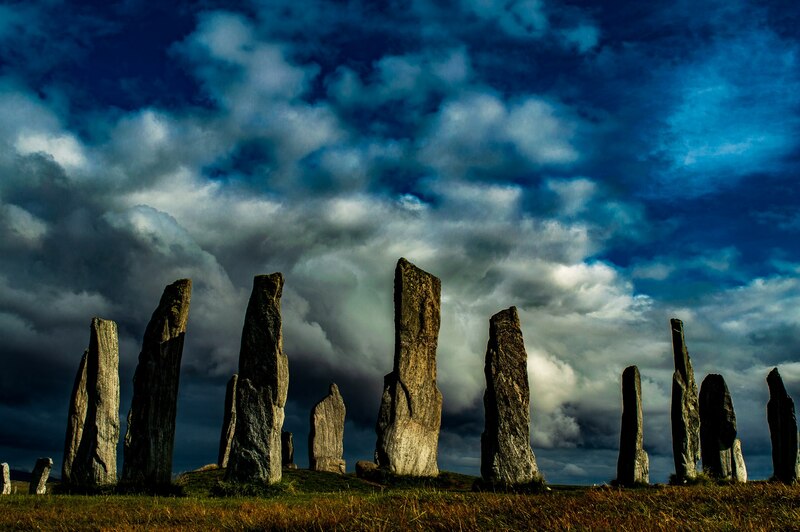 The Callanish Stones are located on the Isle of Lewis and were laid down long before Stonehenge. 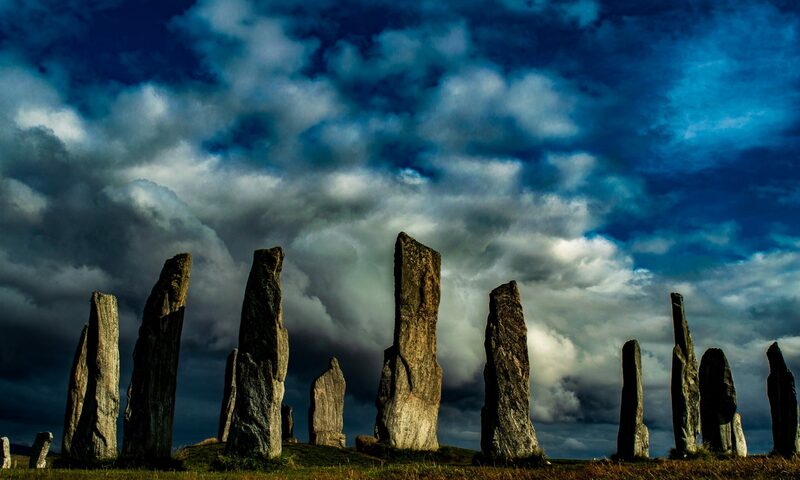 It is a beautiful place to visit and all the more special when there is no one else there to get in your shot. Thanks to my cousin Scott for taking the time out to show me the delights of the Uig coastline. 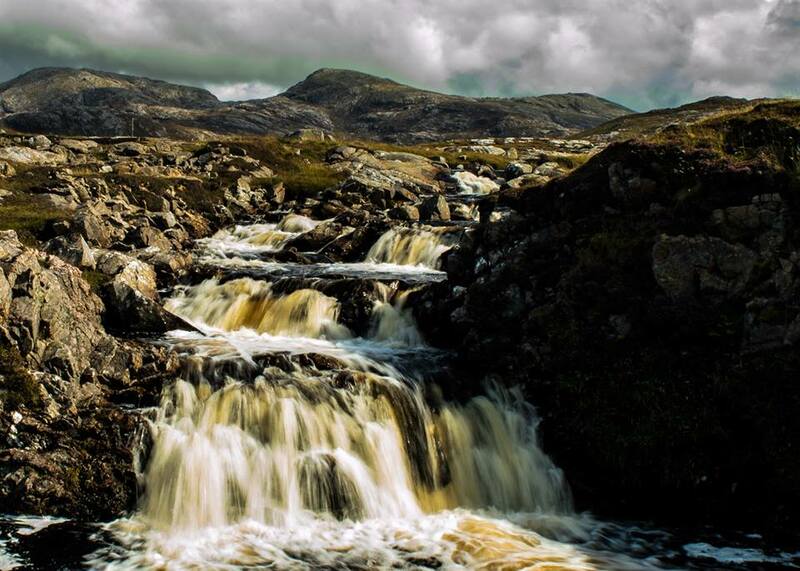 Along the way we stopped to photograph many beautiful spots however the falls at Breanish really grabbed my attention. One evening the whole family went out to visit my fathers grave in Ness – it is by the sea and this is the view he has – miss you Dad but glad you have a great view. 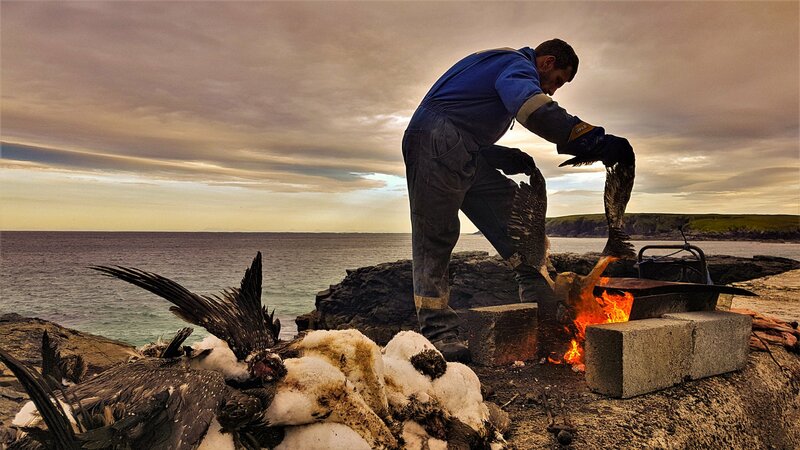 My family carry on the tradition of the Guga Hunt each year on the rocky island of Sula Sgeir. 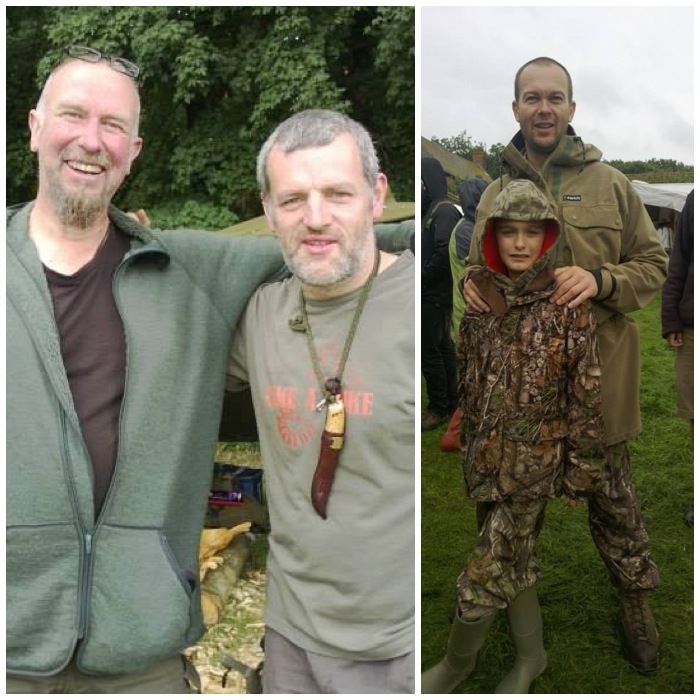 As I left the island at sixteen I never went on the hunt – this year though I went out with the fishing boat to pick up the lads and bring them home. 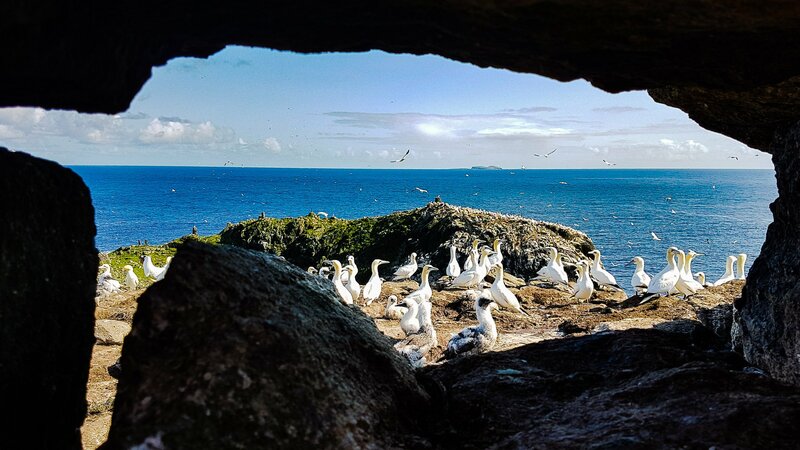 Looking out from this crack in the rocks on Sula Sgeir I was able to make out the other lonely outpost in the Atlantic that is North Rona. 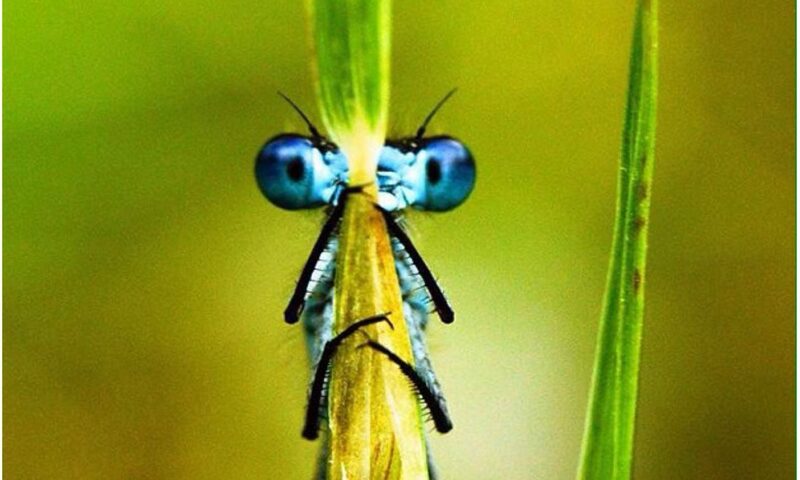 A good month for a holiday and a good month for photography. 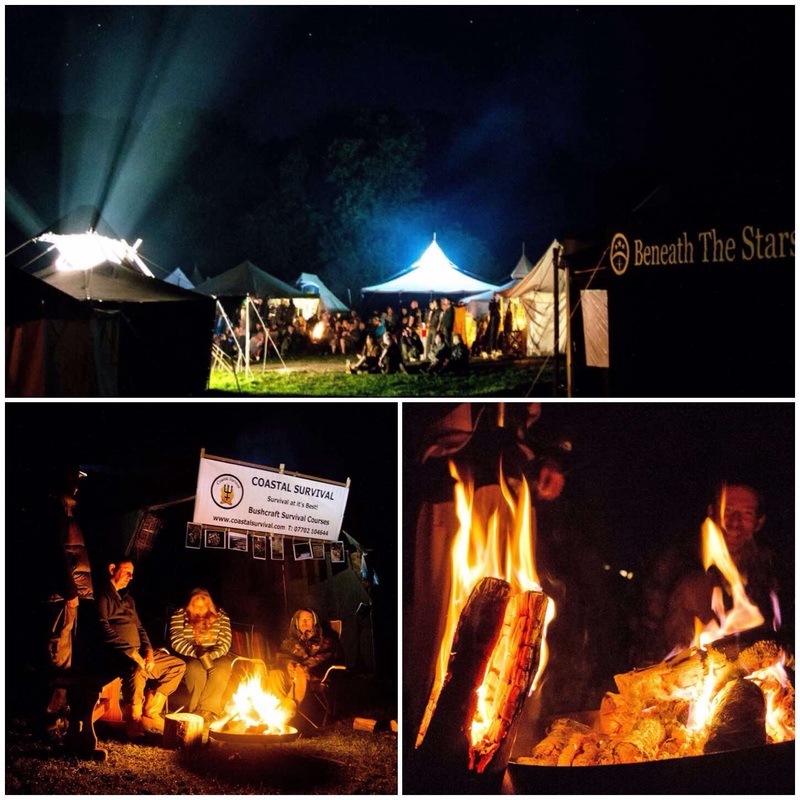 Over the last few years one of the changes I have seen at the Wilderness Gathering is the quality of the music in the evenings – this year it was particularly great. 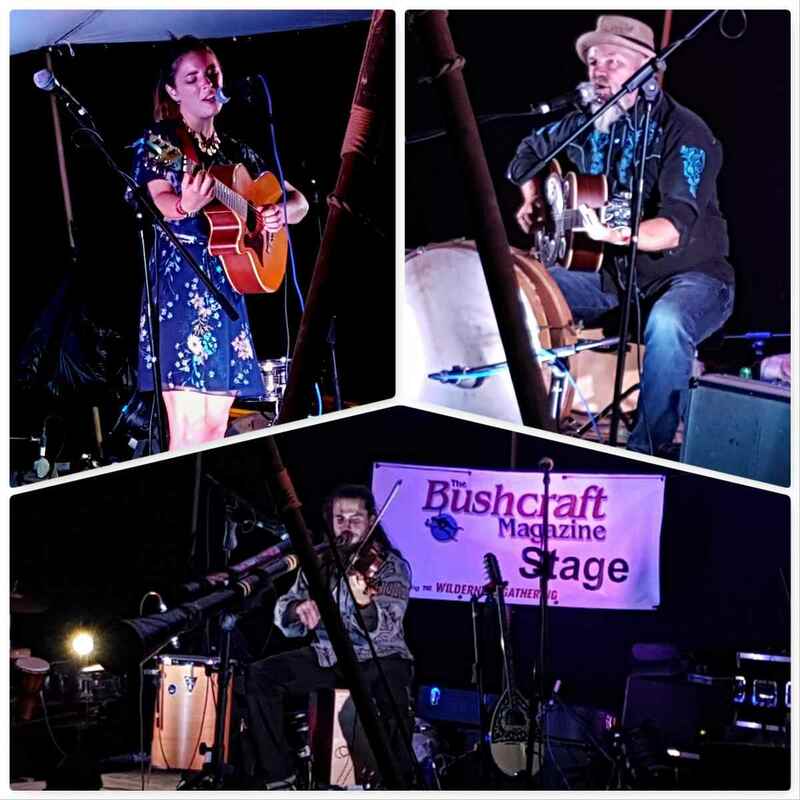 Roger Harrington of Bison Bushcraft and Dom Harvey (they run the Wilderness Gathering) had great music playing each night however I was particularly struck by one young musician – Vojta. He is a violinist at heart but somehow brings in many other instruments to his sessions. 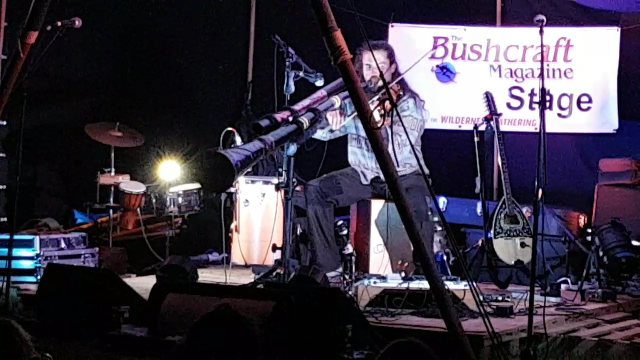 Here is the last number he played at this years Wilderness Gathering. 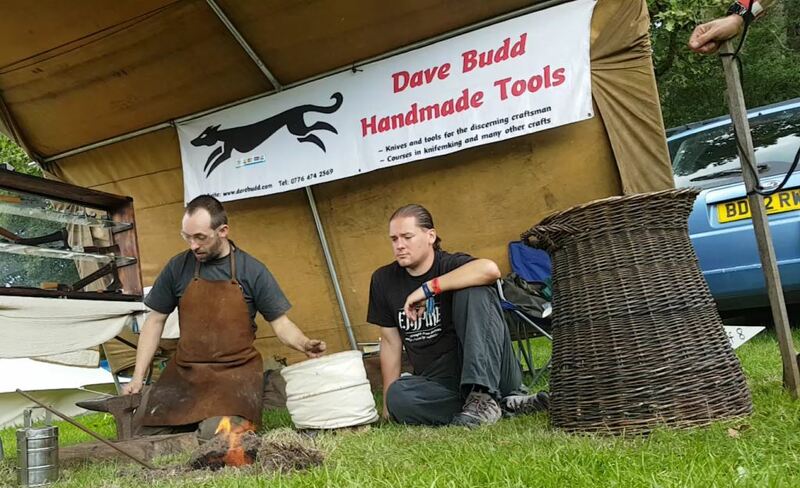 While having a wander around the Wilderness Gathering this year I spotted my friend Dave Budd – Master Blacksmith – hard at work. I was unsure at first what he was making so hung around and filmed the process. I liked the end result I bought it as a present for a friend. Cheers for the show Dave. 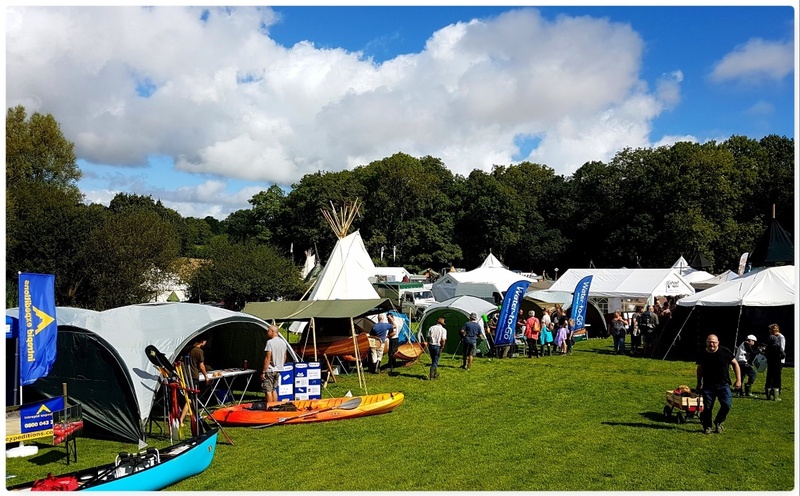 This last week I have had a great time at the Wilderness Gathering here in the UK with Fraser Christian of Coastal Survival. I will write a more detailed report on the Gathering later but just wanted to share with you today a little video I grabbed just before I left. 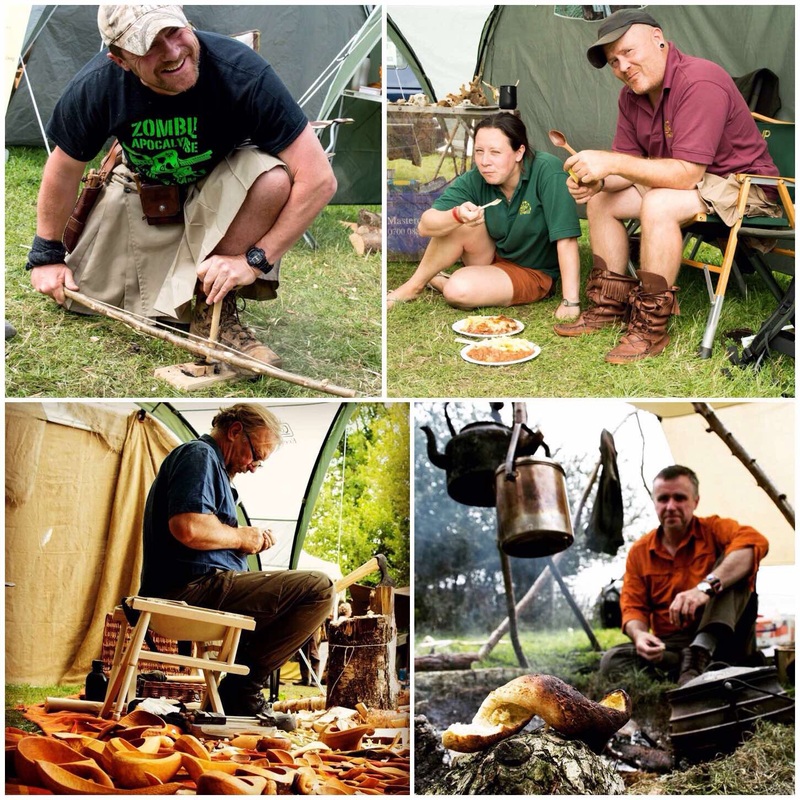 Last August found me at the Wilderness Gathering here in the UK with my good friend Fraser Christian of Coastal Survival. 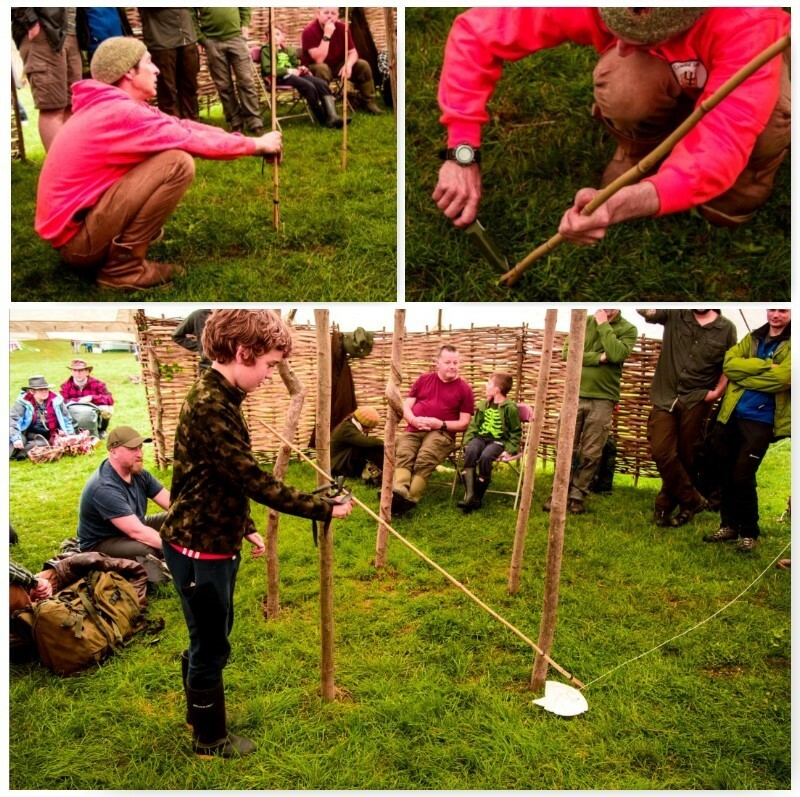 Fraser ran a Masterclass at the Gathering for about 8 people in how to make a stick fish trap. 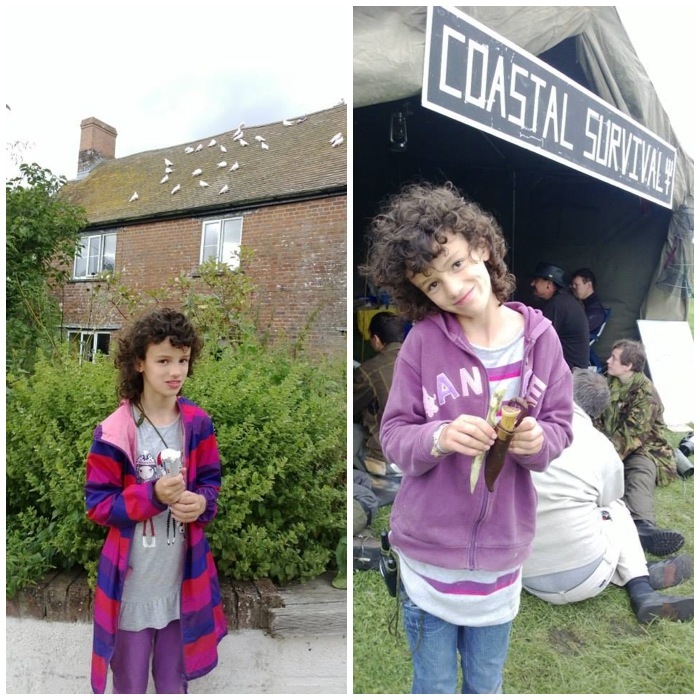 Fraser has a couple of books out now called Eat the Beach and Coast Hunter (he is currently working on his third book called Castaway on the Seashore). 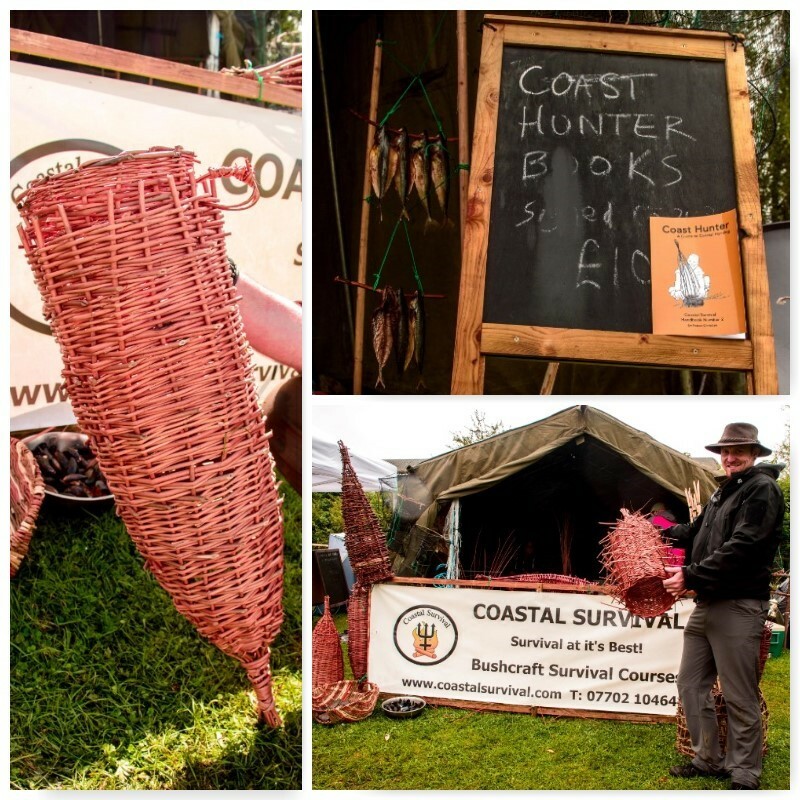 In the book Coast Hunter Fraser goes into detail on many coastal hunting techniques (including making this trap) and I encourage you to get a copy of these books if you are interested in the art of coastal survival. Fraser uses this type of trap on the coast weighted down with stones in the inter-tidal zone to catch fish, crabs and lobsters. 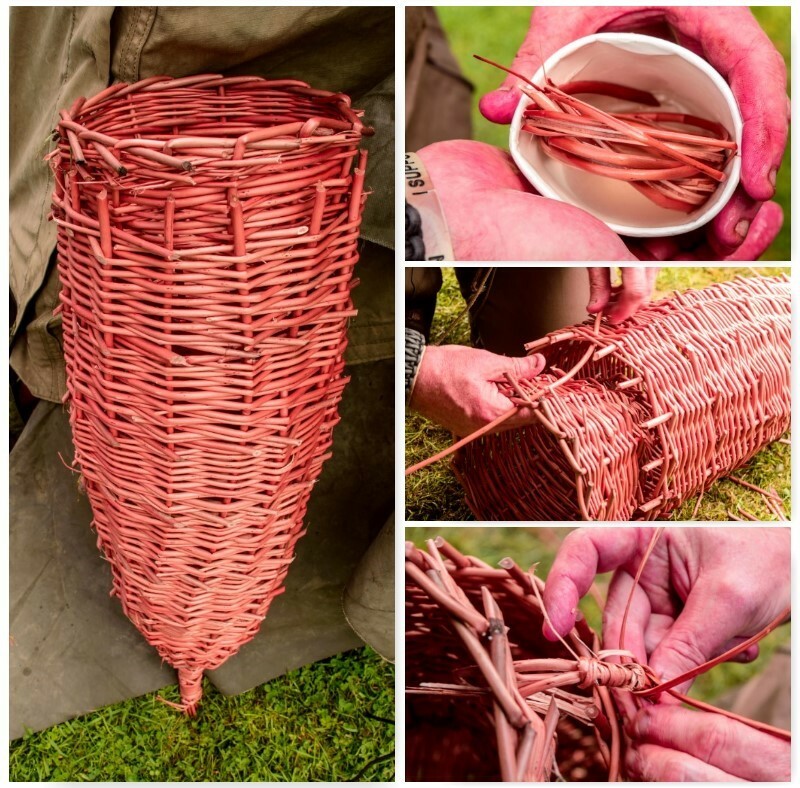 You can make the trap with many different woods found in the woods and hedgerows – just make sure it is pliable. 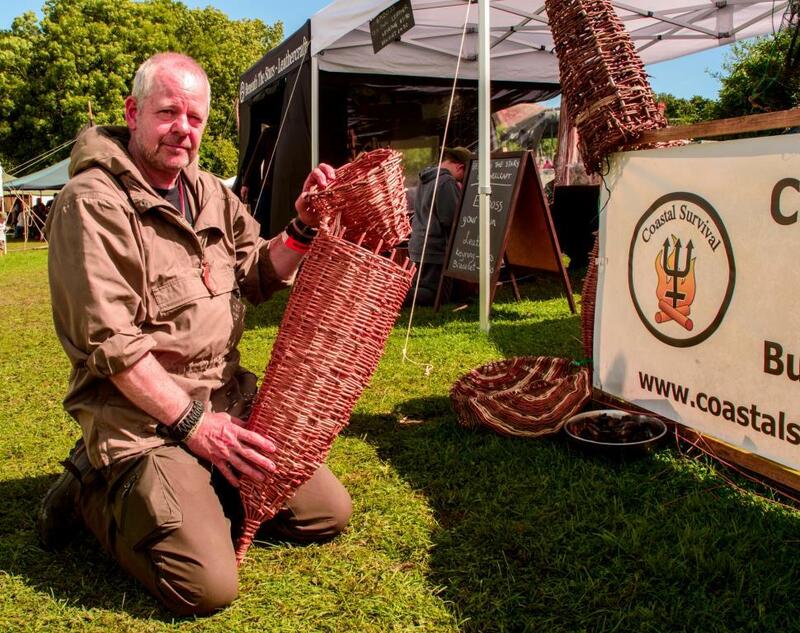 As he was running a class for 8 people he brought in some commercial willow from Musgrove Willows. I will go through the steps as I saw them on the day but for more detail on this trap have a look inside the Coast hunter book. 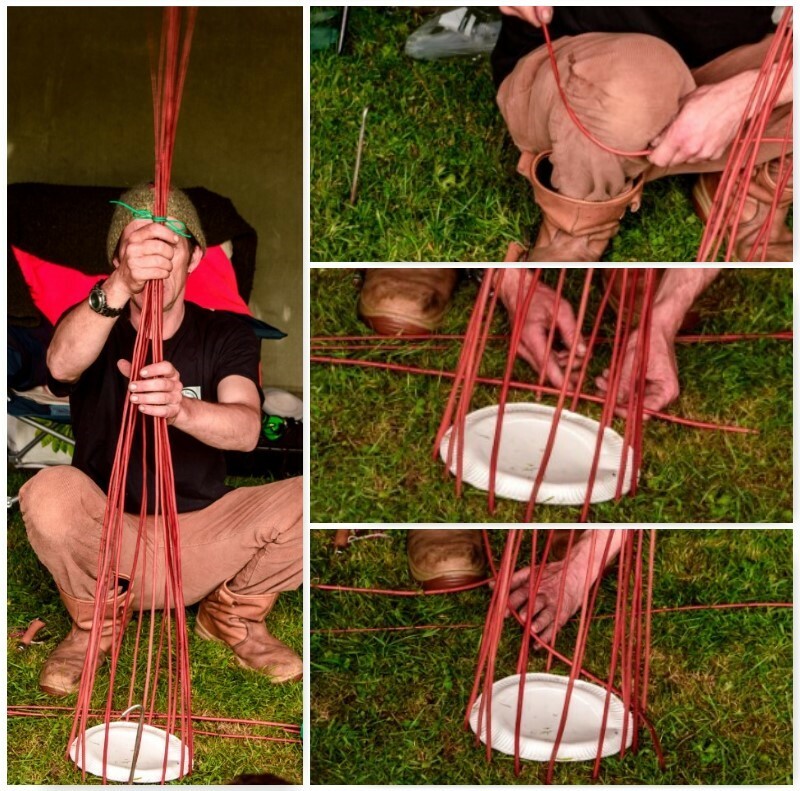 To form the shape Fraser used a paper plate and a tent peg to create a circle of willow. 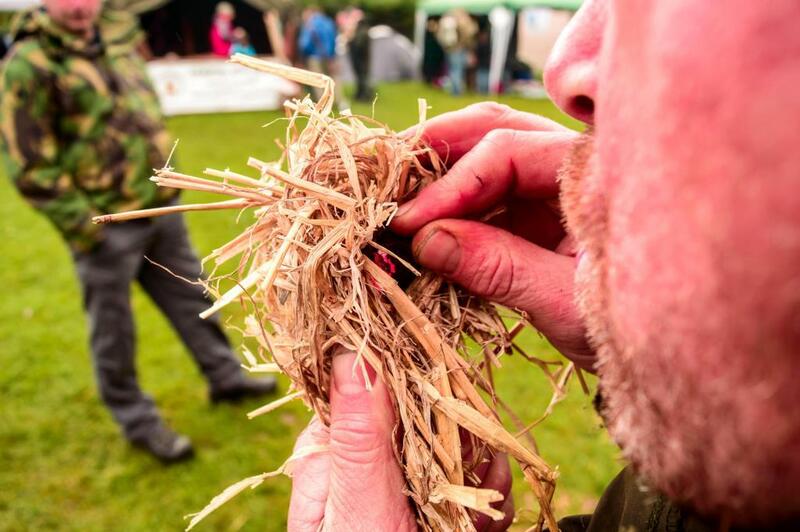 He tried to maintain an even distance (about two fingers width between each piece of willow) as he inserted the willow (thick ends) into the ground, They were pushed in about 10cm’s and the tent peg really helped as the ground was hard. 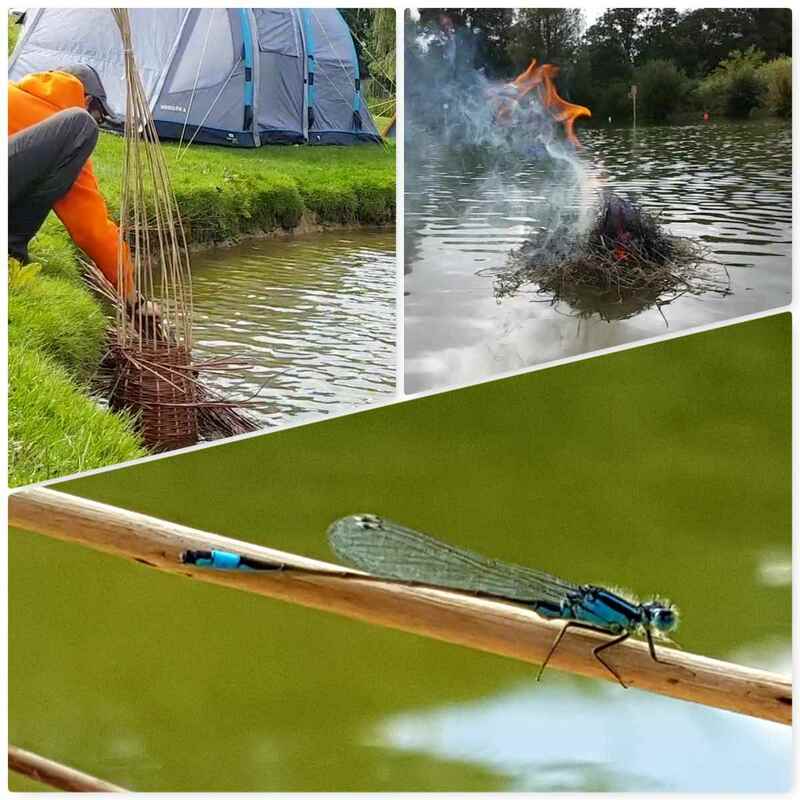 Once the willow was secured in the ground he tied of the top ensuring the willow sticks all came in at the same angle. 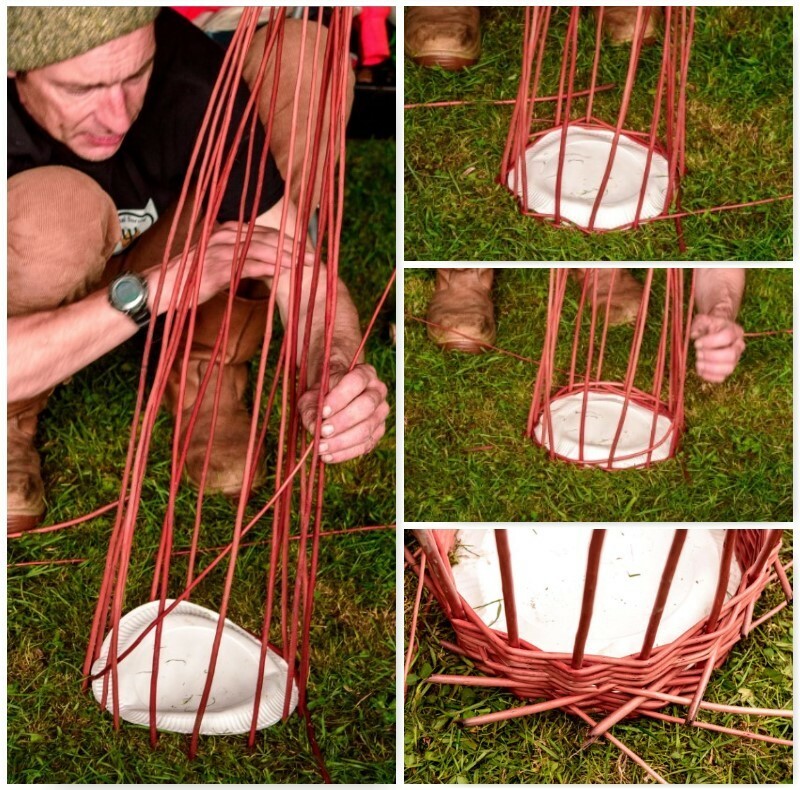 The willow had been left overnight in a lake to ensure it was as pliable as possible however to make sure Fraser pulled each piece of willow he would weave with around his knee. 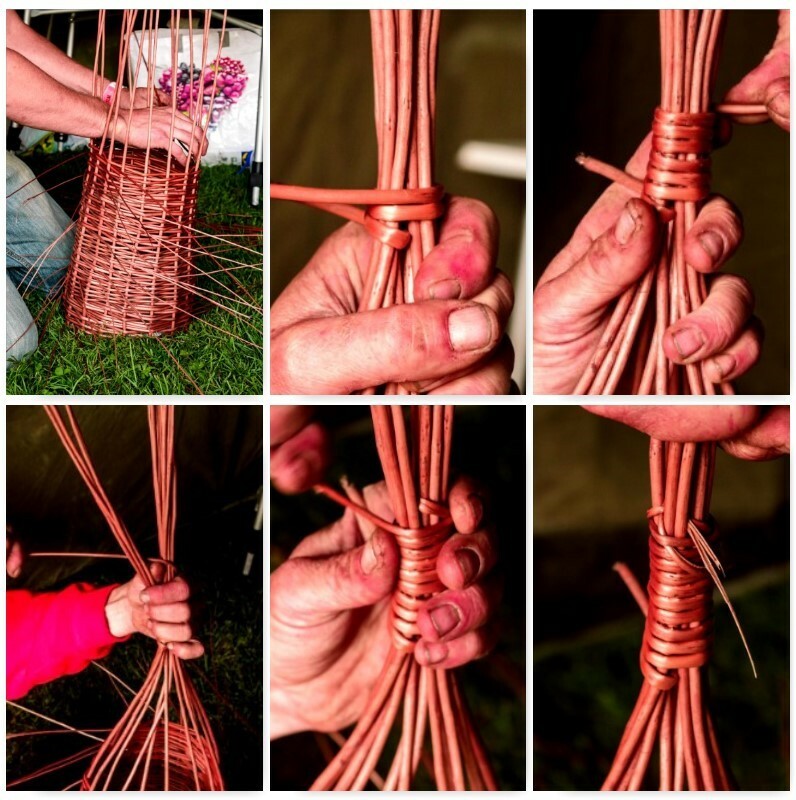 This makes the weaving process so much easier and less tiring on your hands. 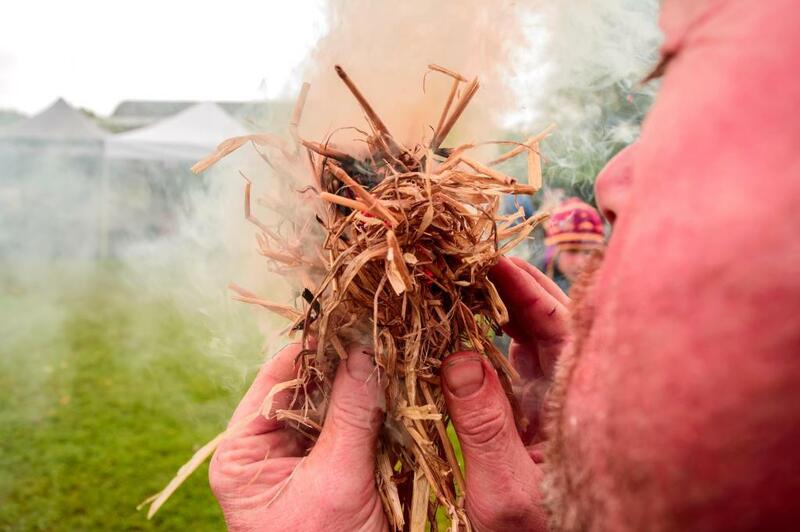 Starting with the thick end of a piece of willow he threaded it in and out between 4 or 5 uprights, Once that was secure he raised up the thinner in to carry on that in and out weave (raising the tip of the thinner end really makes the weaving easier). 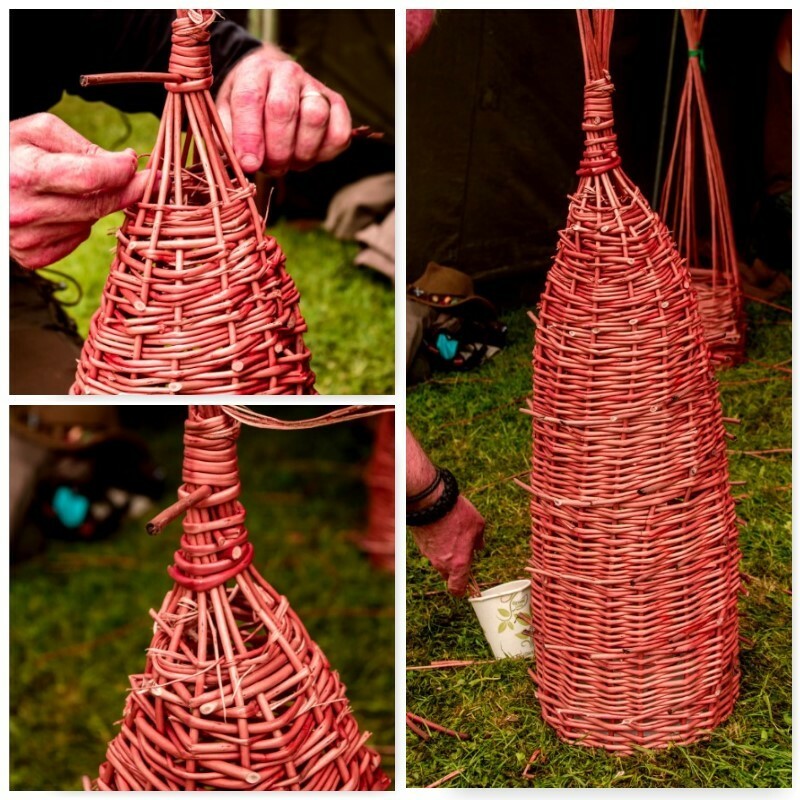 In the picture in the bottom left you can clearly see that raised thin end being woven in and out of the uprights. He stopped the weave when he judged that part was too thin (the excess would be trimmed off later). 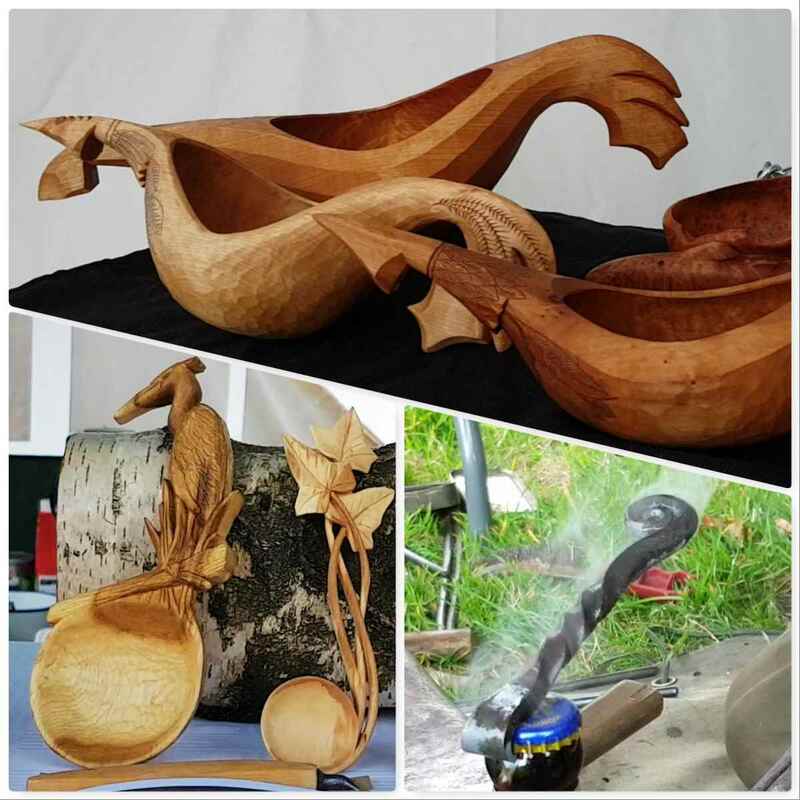 Once one piece was finished it was a case of repeating the process with a new piece of willow but from the next upright along. You can see in the picture in the bottom right below these staggered start points. Frase ensured that the ends stuck out proud so that they would not slip off the first upright while weaving. These would be trimmed down later. 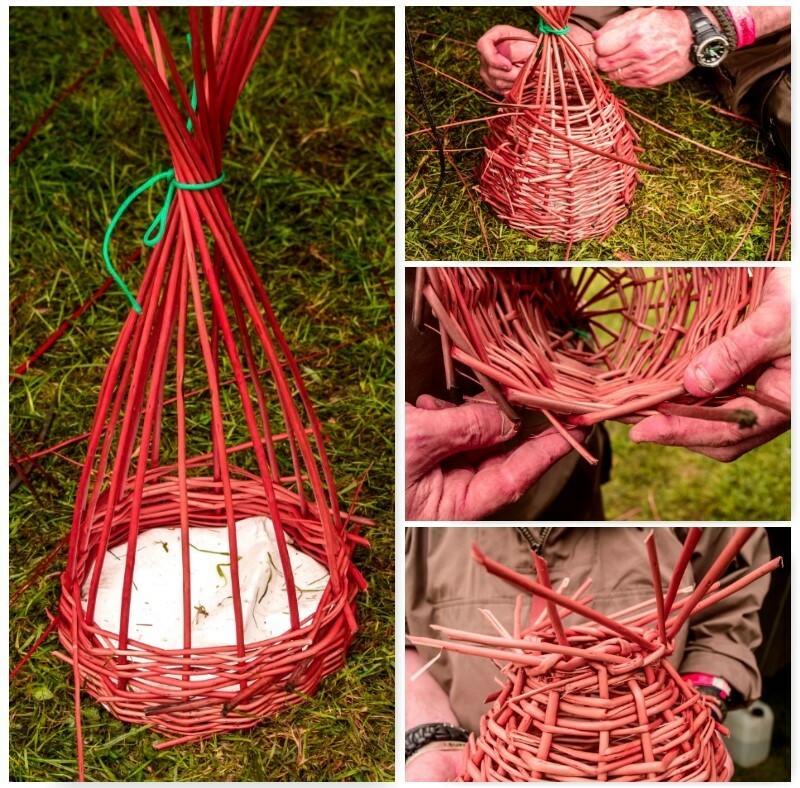 Over time the trap started to develop (a height of 50 or 60 cm’s) and the string at the top was replaced with willow. I have put the steps for you below. The thick end was slid through the middle of the uprights then wrapped tightly around the uprights for about ten turns, through the uprights again, a couple more turns and back through once more to finish. 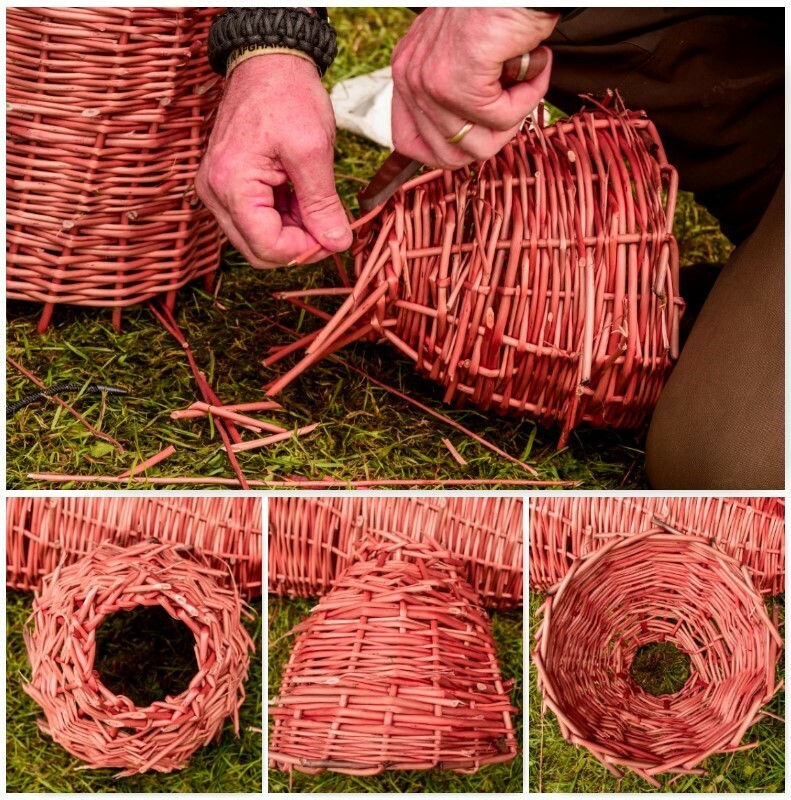 Finishing the top section can be quite difficult as you have less room to push the willow in and out of the uprights. 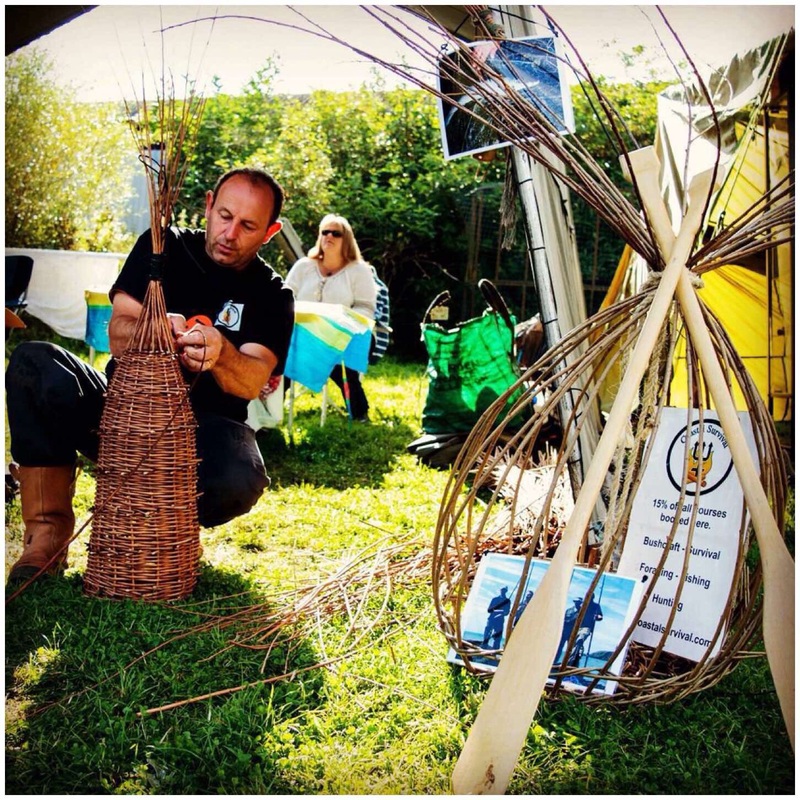 Make the willow as pliable as possible and experiment with smaller thinner pieces and with starting with the thin end and threading through the thicker end. Depending on what you are hoping to catch will decide how much of a gap to leave but ideally the gap should only be a couple of centimetres. When the top has been finished pull the trap out of the ground slowly and it is time to lock off the uprights around the opening. Take one upright and bend it over in front of the one directly to its right but behind the 2nd one on the right. Repeat the process with the upright on the right and so on. Before long you will be left with just one upright standing vertically. Twist it back and forth and you can thread it easily through the laid uprights to its right. Look closely at the pictures below and you will see how this works. The lid is about a third of the size of the main body of the trap however the opening is the same size. 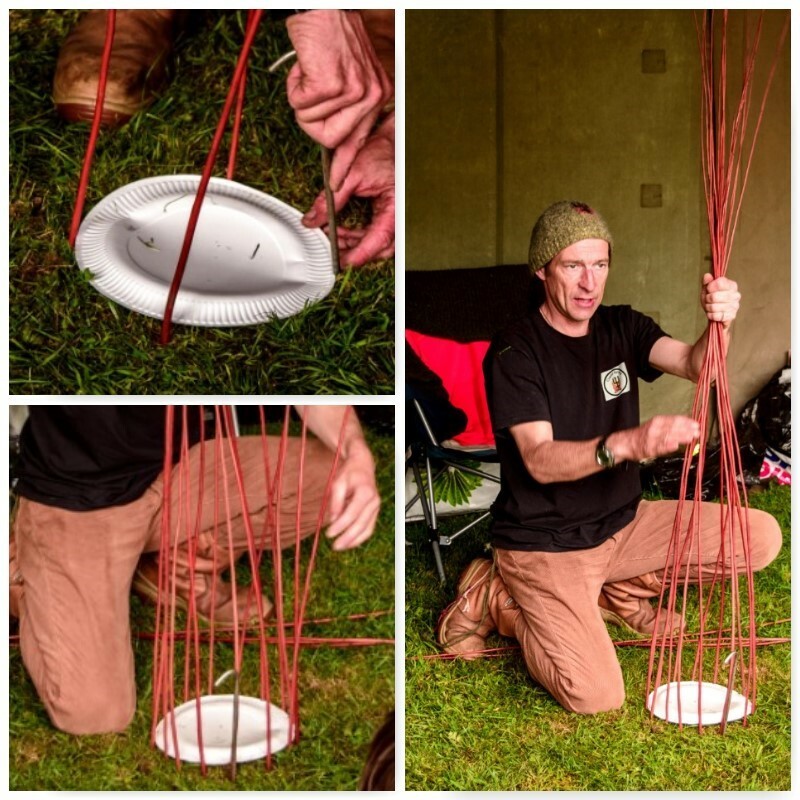 Use the paper plate, peg and string in the same fashion as before to set up the skeleton of the lid and weave in the exact same way as with the main body of the trap. 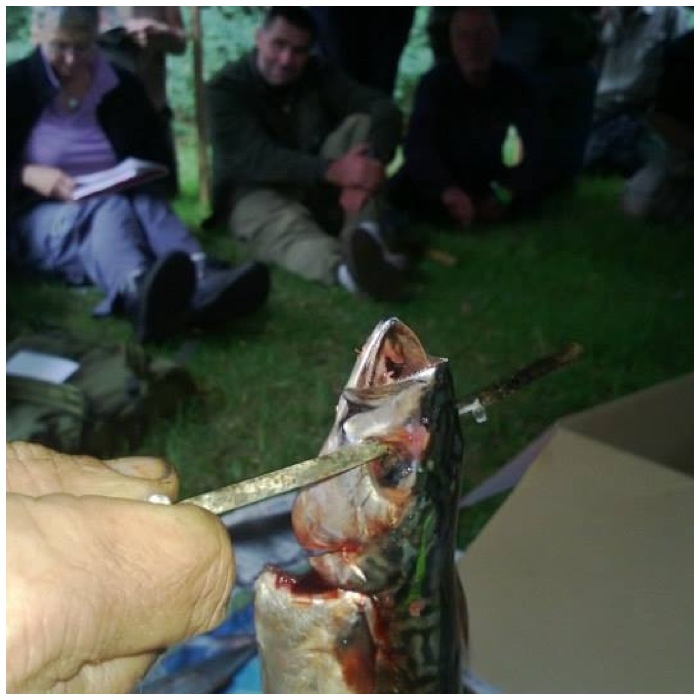 The difference though is that the top is not tied off but left open as this will become the opening that your catch will enter the trap through. When the hole in the top is about the size of your fist repeat the process of locking off at Step 5. 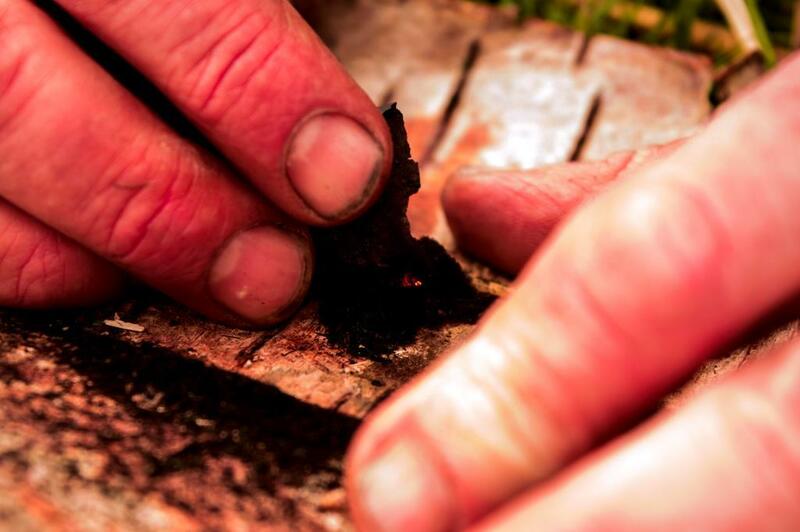 You will also need to lock of the rim around the bigger opening when it is pulled out of the ground. 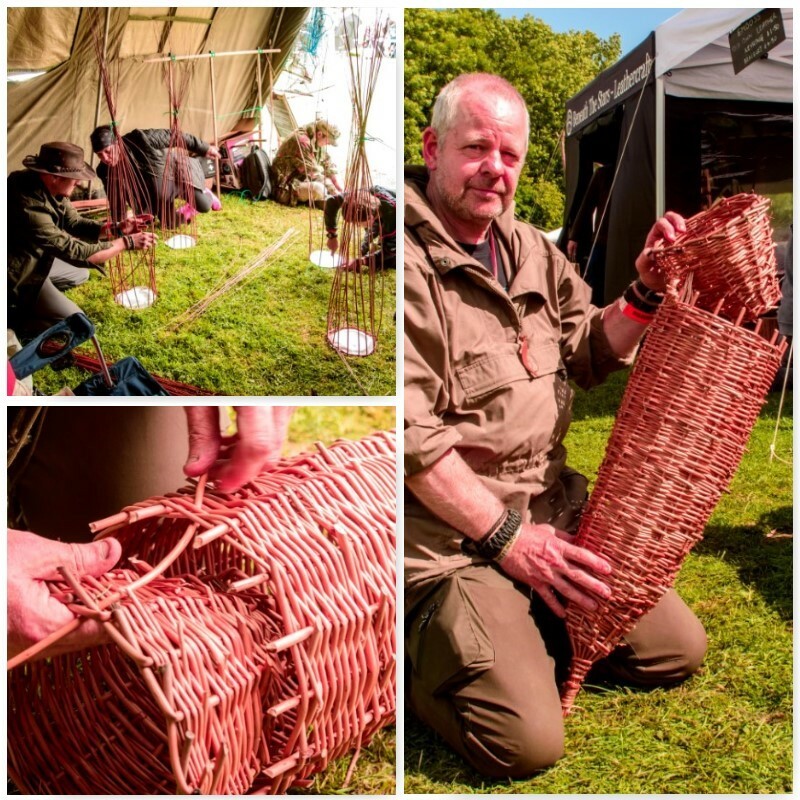 When you trim off the ends of any piece of willow when making this type of trap try to leave about a cm or so sticking out so that the end of the willow does not slip inside the trap. The outside should be quite prickly but the inside should be smooth. 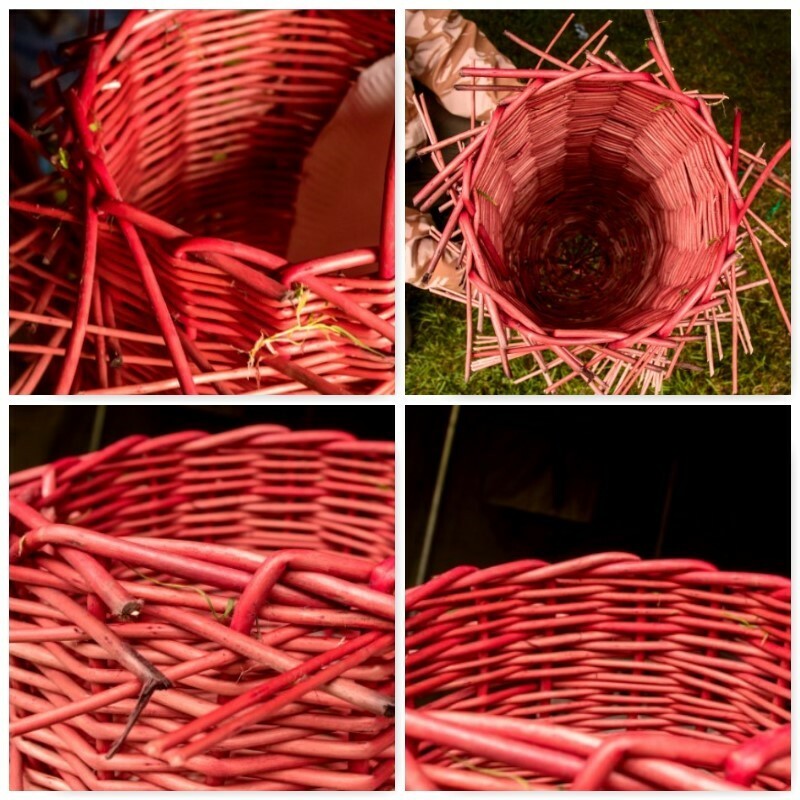 The lid should sit in the opening of the main body of the trap with the small opening in it well inside it. 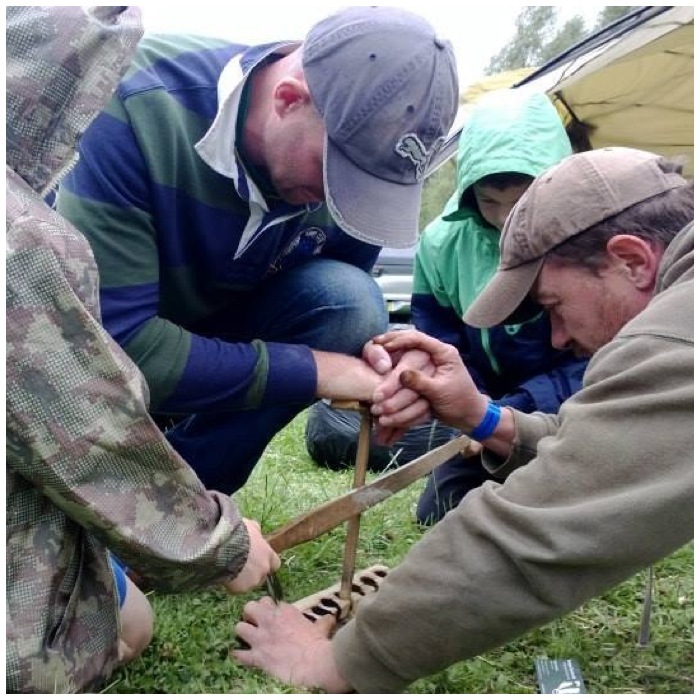 We split and soaked some willow (soaked in a cup of water) to make it really flexible and used that to tie the lid and the main body of the trap together. 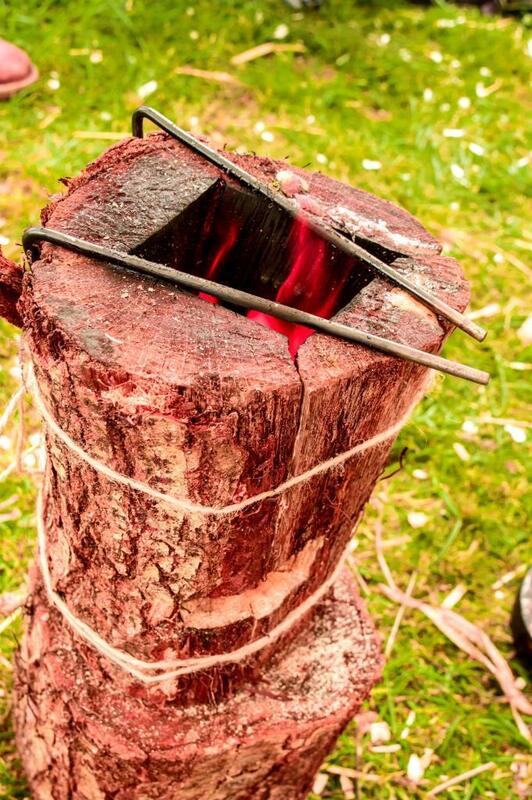 They were tied together at one point only to ensure that the lid stayed attached but could be opened easily to remove any catch or to place any bait. 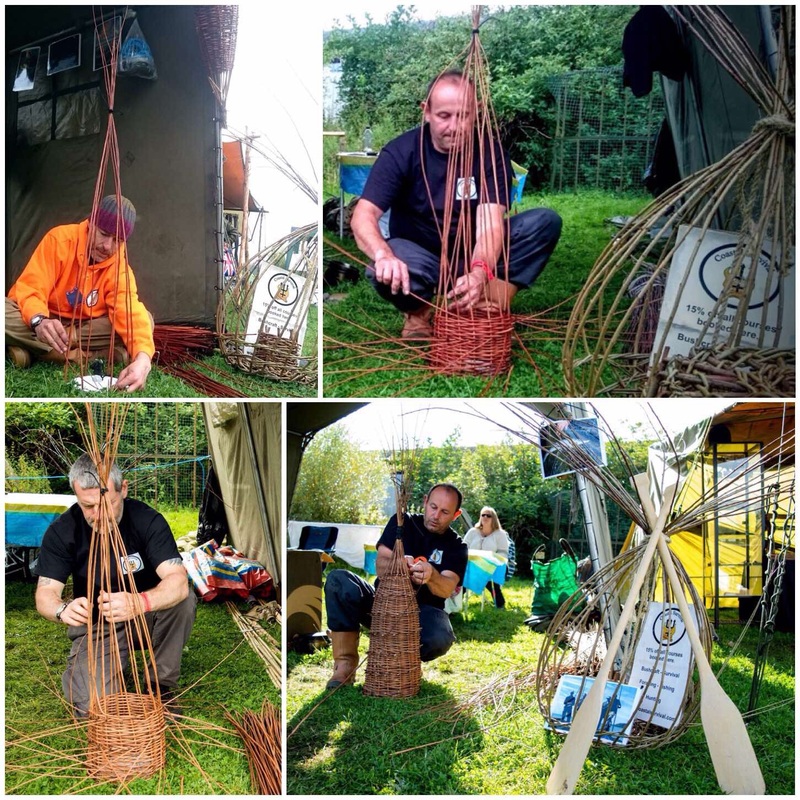 This project would take a confident weaver/basket maker a few hours to make however our students took most of the day (and one or two came back the next day to finish off) to complete theirs. 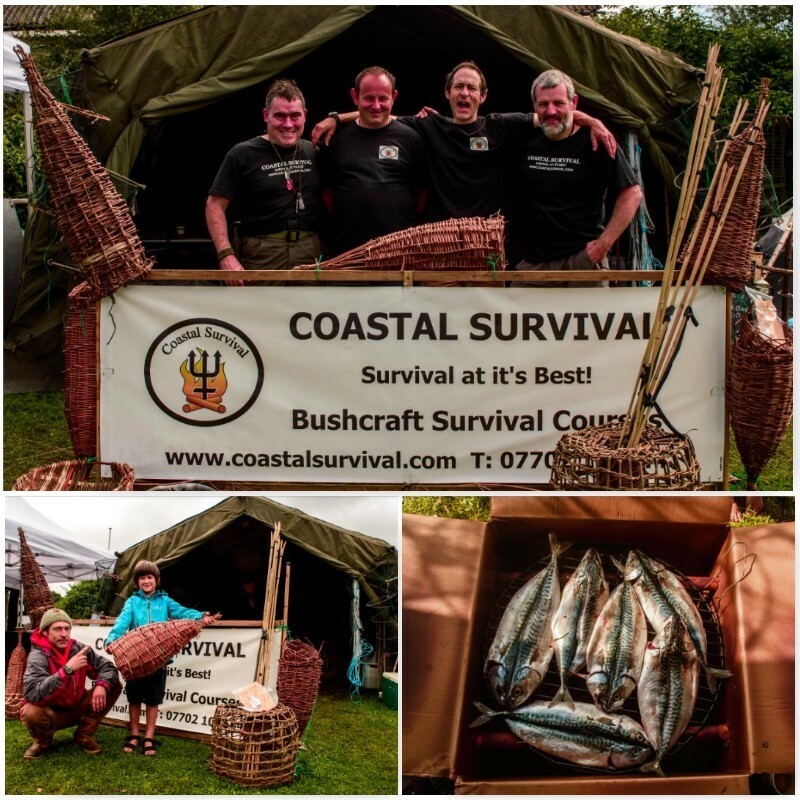 These traps are not just for show but tools for living as comfortably as you can on the coast. 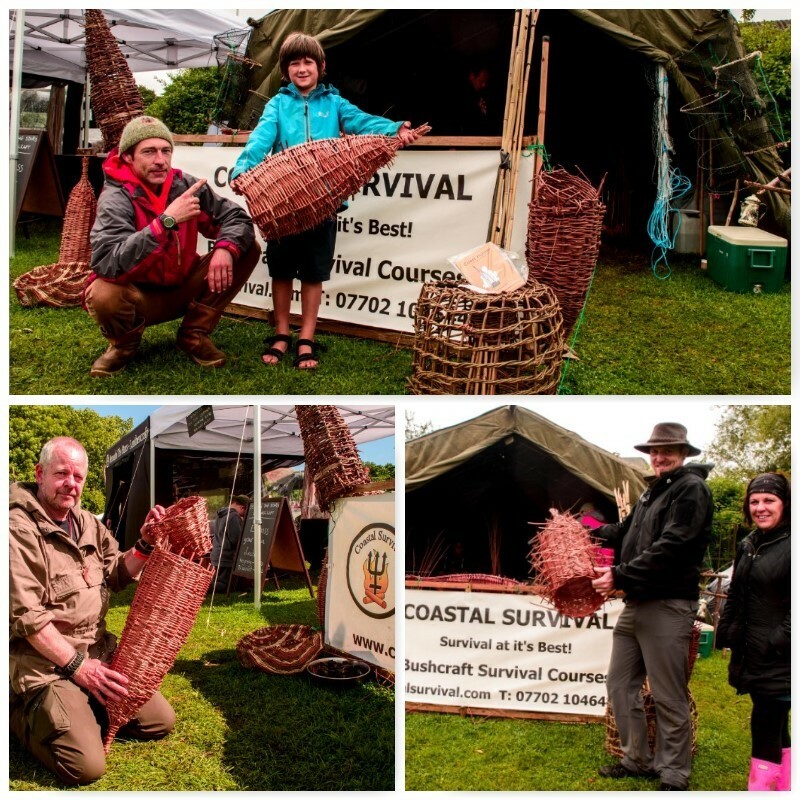 If you are interested in making these traps under a bit of guidance do contact Fraser at Coastal Survival. 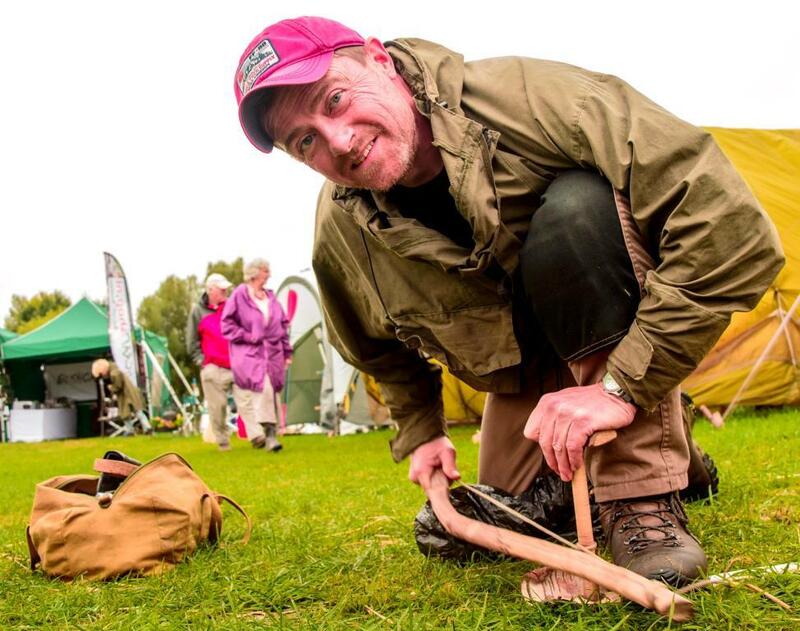 As with any trap do check out whether it is legal to use it in the place you want to set it. 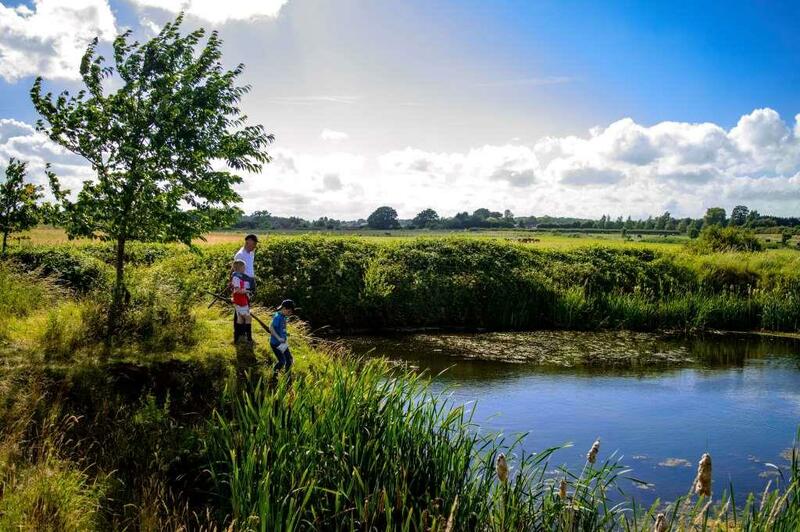 In the UK check out the Environment Agency. 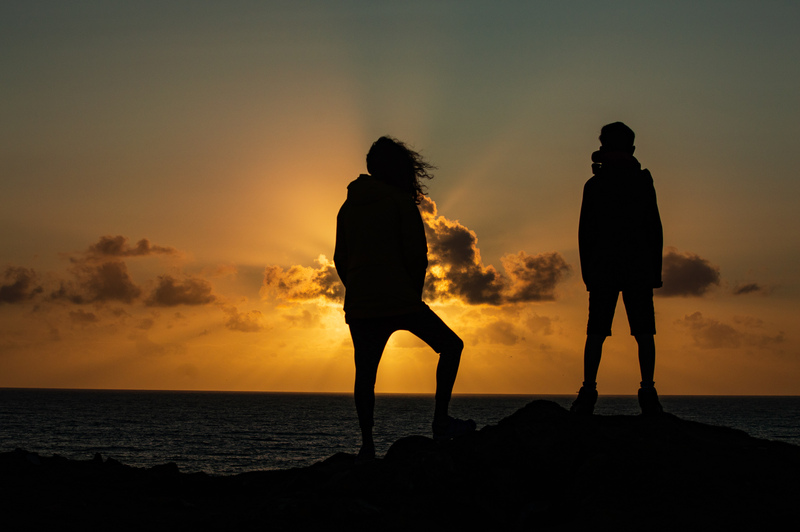 I am told that if you keep doing the same thing each year, such as going to the same holiday destination, that time will seem to speed up as you get older. I agree with that to a point but as far as I’m concerned it’s what you get up to at your favourite destination that’s important. 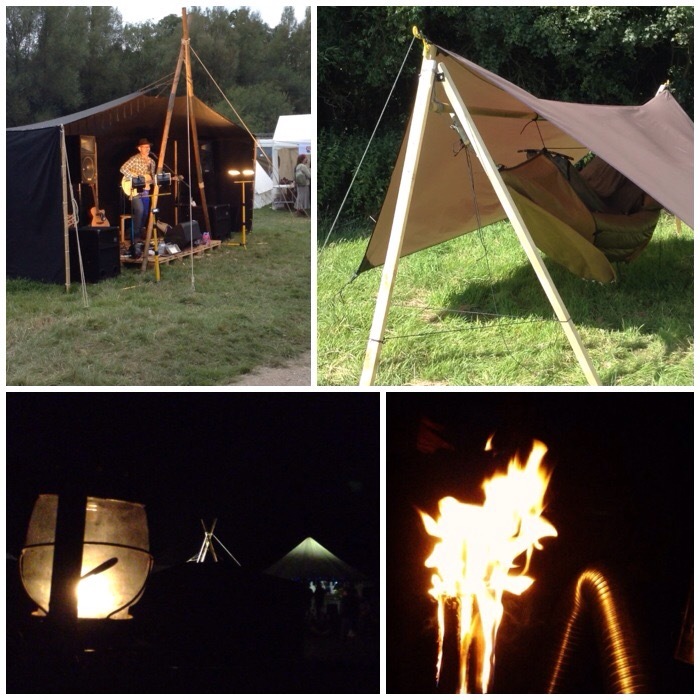 I missed the very first Wilderness Gathering but have been to all the rest since and to combat that sense of time passing quickly I make sure I do something new each time. This year my focus was on the art of filming (there are five short videos in this blog post). 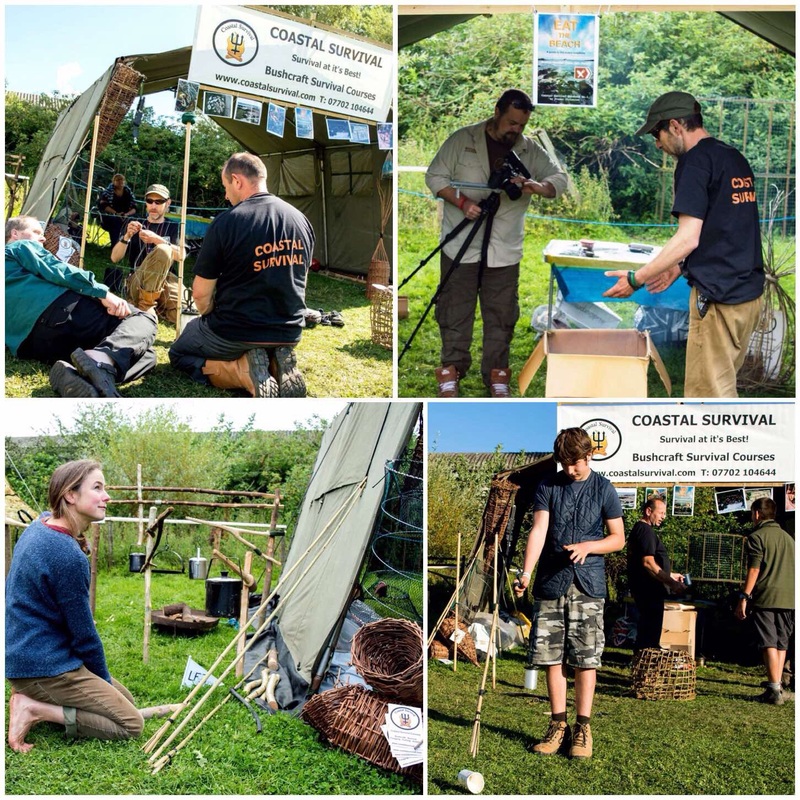 For the third year I helped out Fraser from Coastal Survival, mostly in the role of cameraman for him (filming has been my ‘learn’ for this year) but occasionally doing some one-to-one instruction on making fishing spears and nets. 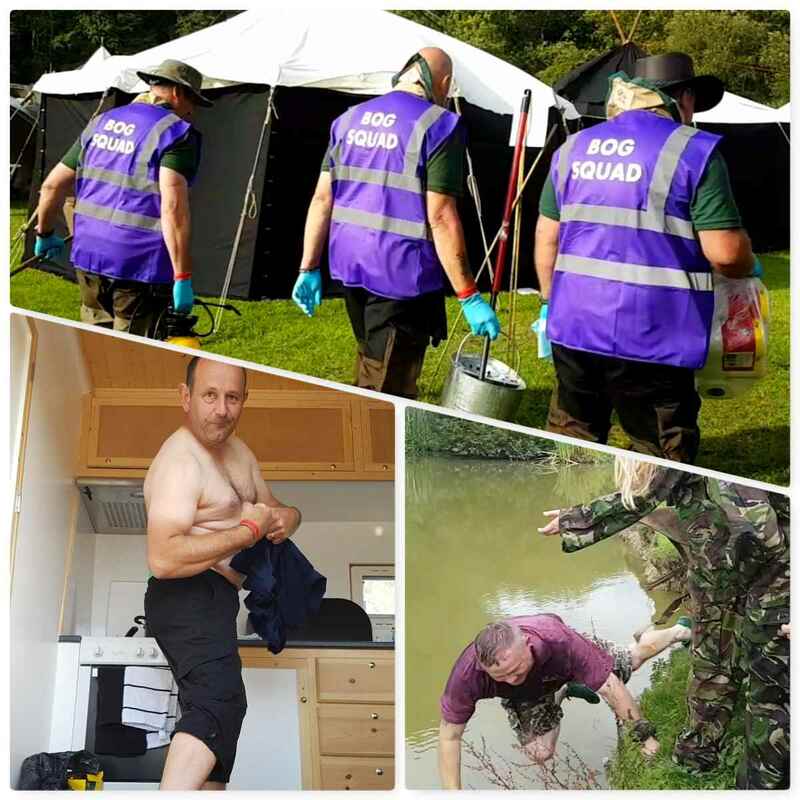 Also in the team was fellow Scot, Steve, and new to the team Leo and Max. 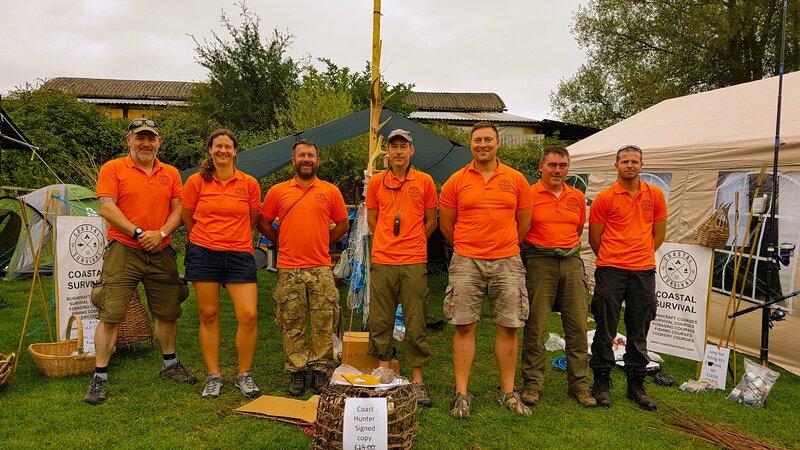 The Gathering is also a time for me to catch up with old friends, such as the selection pictured here: Phil from Badger Bushcraft, JP and Pablo from Woodlife Trails, Pete, Martin (in the Billy the Bushcrafter mask) and Mark from G-Outdoors (there are quite a few more friends pictured later). Also it is a great time to meet new friends such as Phil’s partner Charlie. 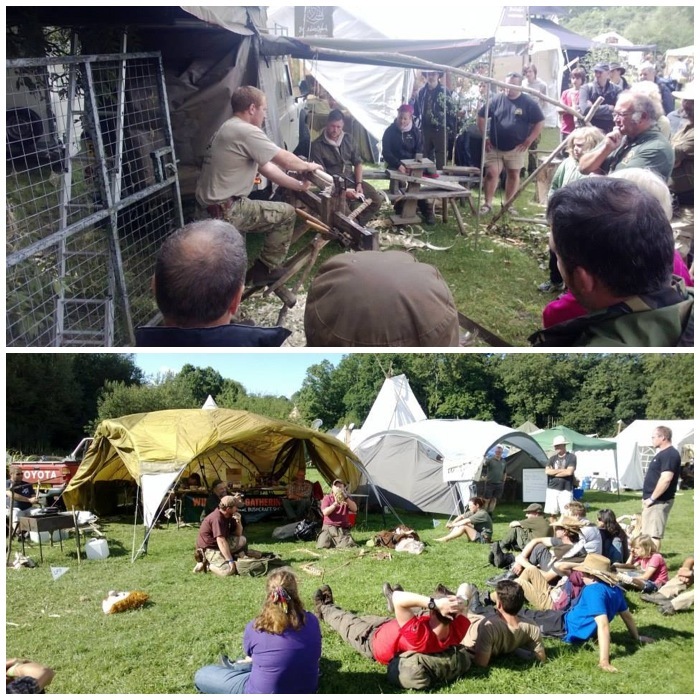 Over all the days there were plenty of workshops going on but due to helping Fraser out I did not spend any great time at one workshop. In a way it was great to flit from class to class and grab a snapshot from as many as I could. 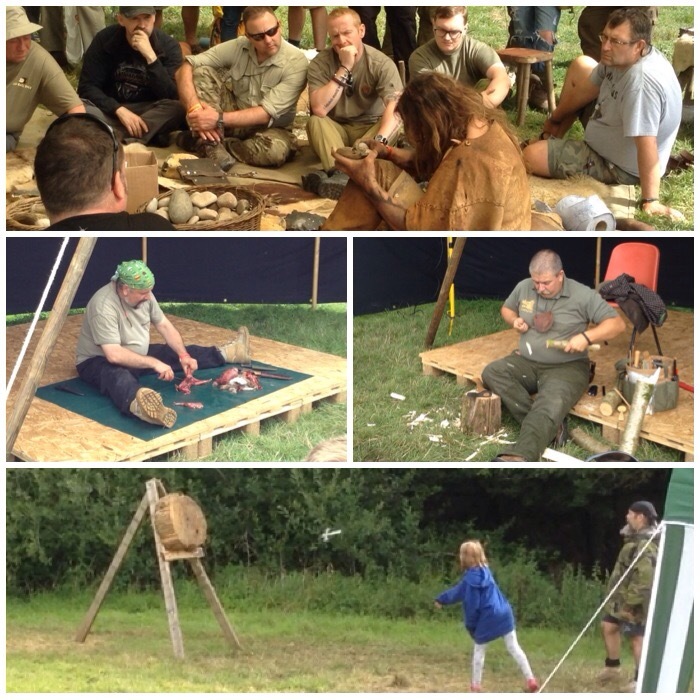 Below you can see Will Lord expertly knapping, Steve and Paul from the Bushcraft Magazine giving some great demonstrations on the stage and I even managed to catch one axe in flight. 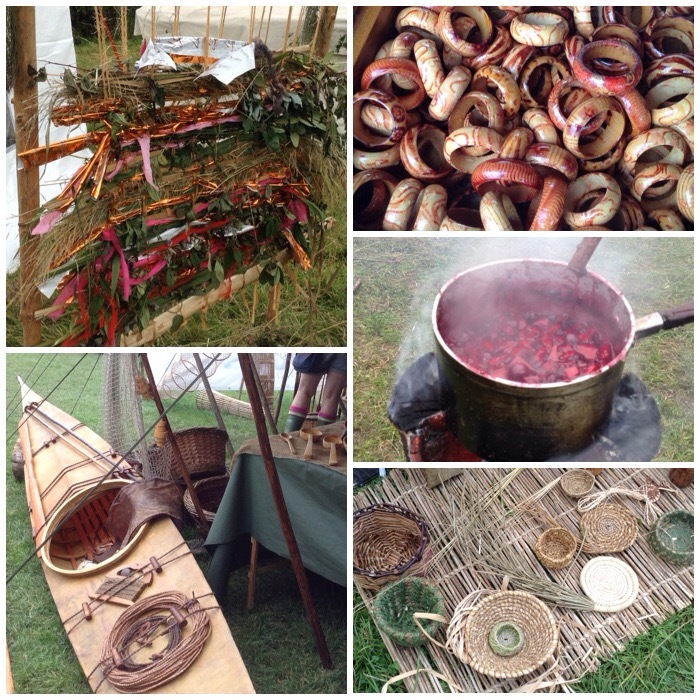 One of the things I like about the Wilderness Gathering is all the art you can see in all its different forms, from the grass mat made in a day to the beautifully crafted kayak made by Patrick from Backwoods Bushcraft. 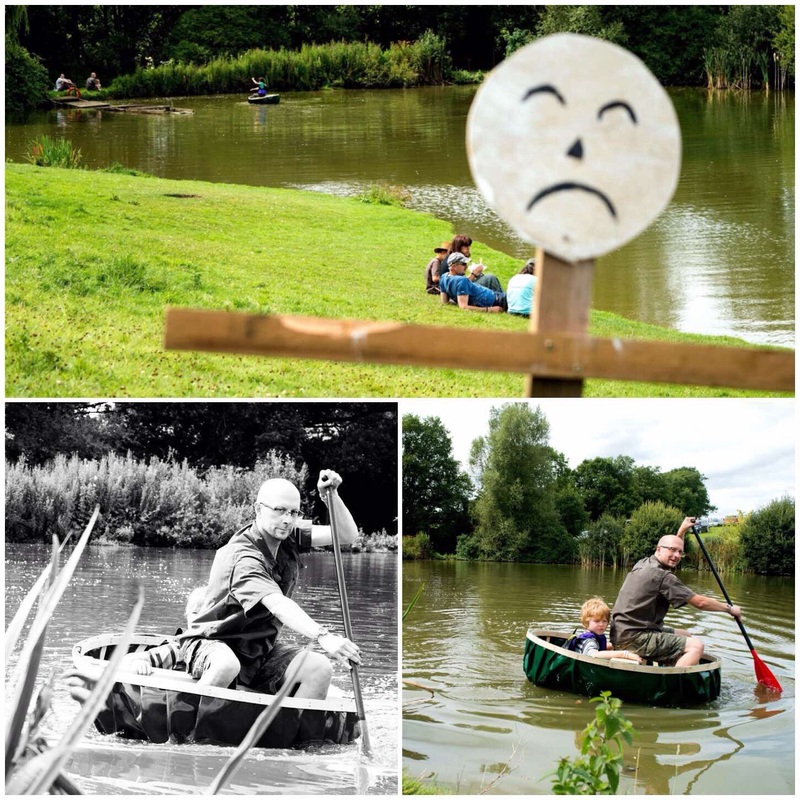 Once each day’s crowds had gone home it was time to tidy up, cook tea and relax. 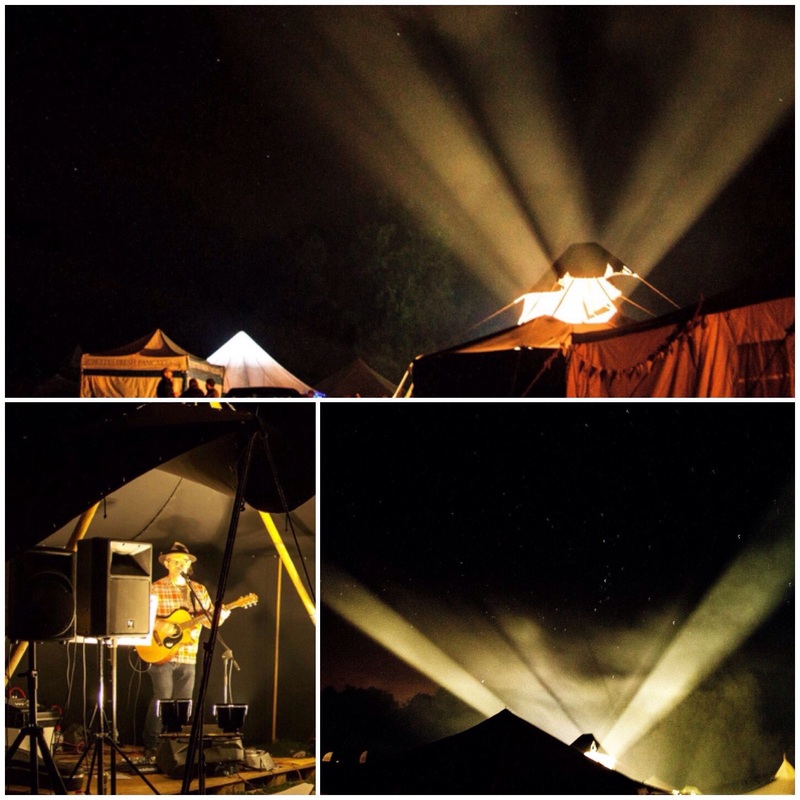 The stage was well attended this year with different acts and it was good to hear the music from most of the site. I slept up in the main car park in my hammock suspended from my own home-made freestanding hammock stand. 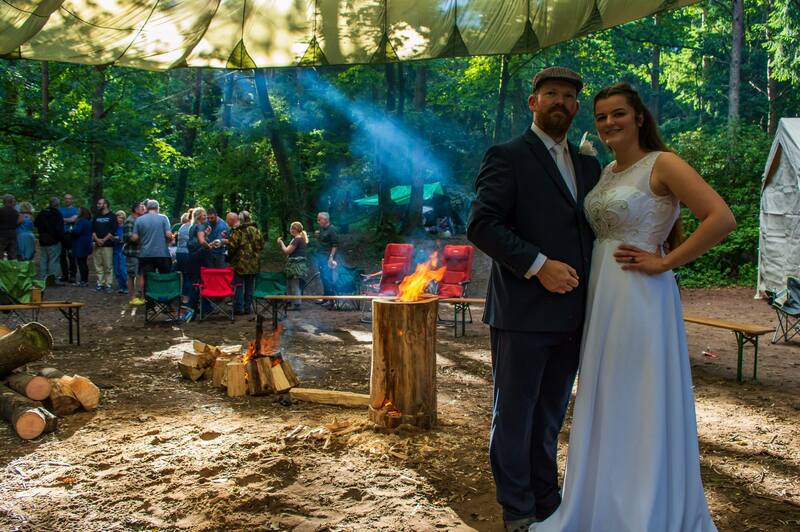 I packed it this year as I turned up a bit late and knew there would be no space left in the woods. 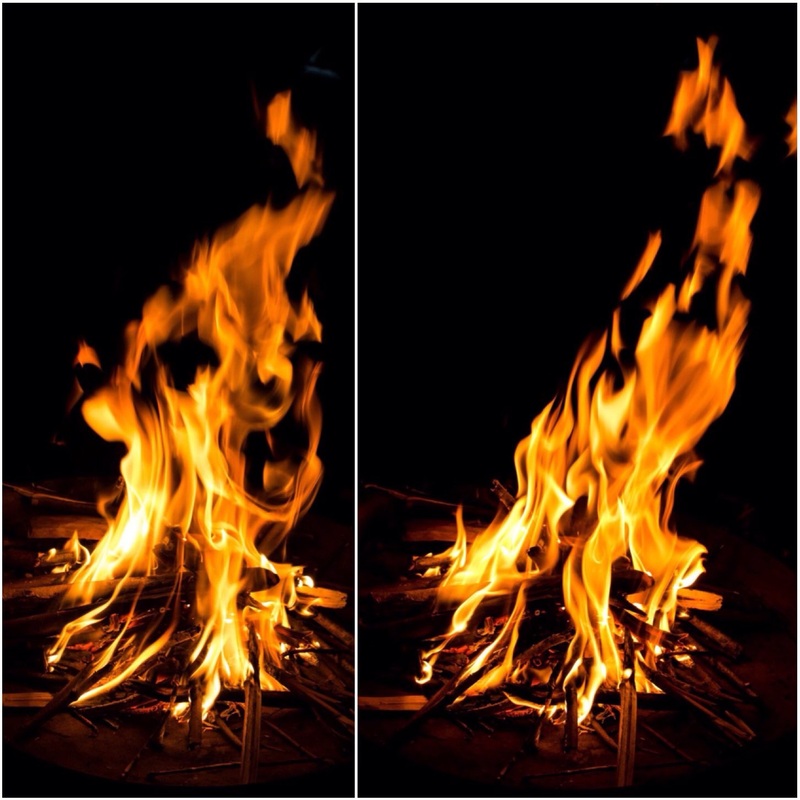 As usual I brought one of my Scandinavian candles along and managed to get one picture showing a couple of great fire faces. 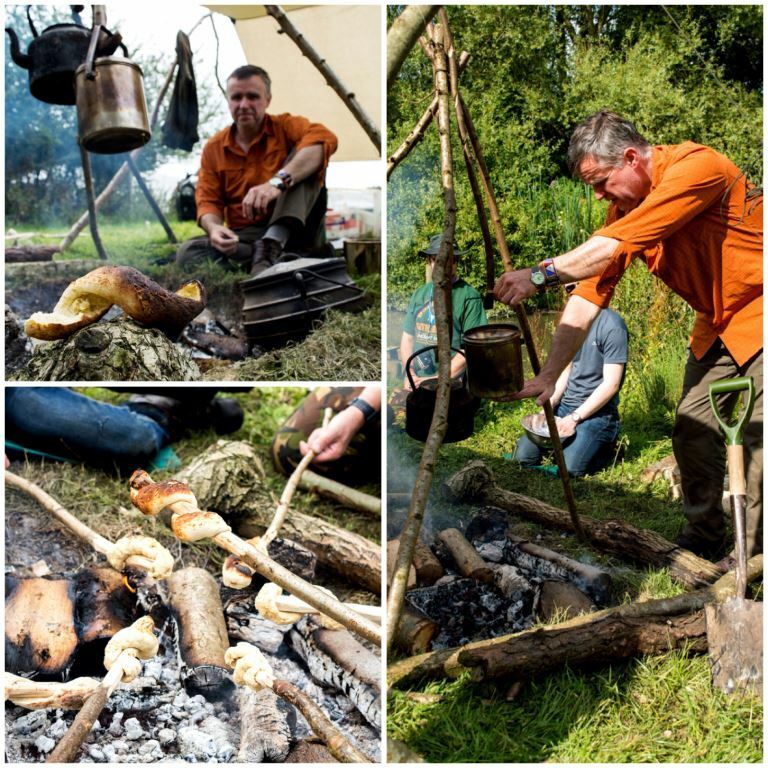 On my wanderings I found that if you were patient enough you could get some great shots of some of the best bushcrafters and woodland workers practising their different arts. 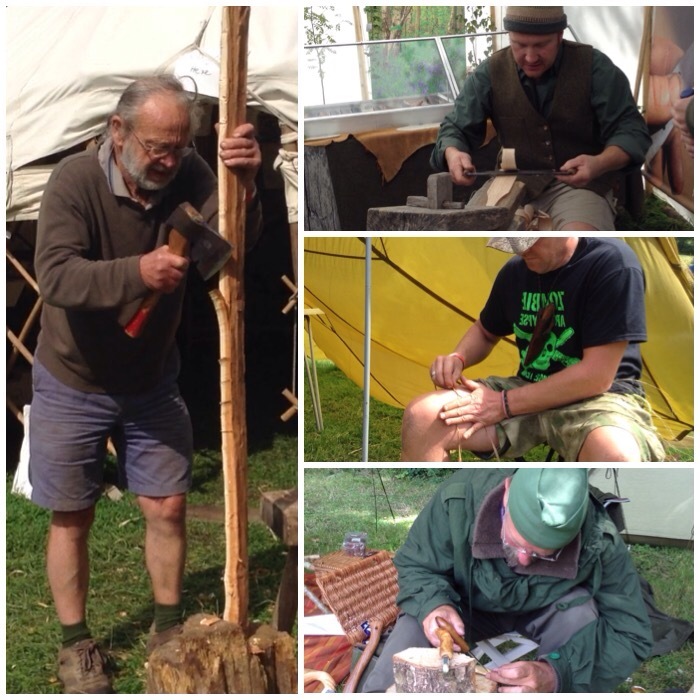 In these pictures you can see Peter Whiteman carving a yew bow, Ben Orford effortlessly creating a spatula, Jason Sears perfectly demonstrating the art of making cordage by rolling it on his thigh (I have never mastered this) and Jon Mac showing the art of chip carving. 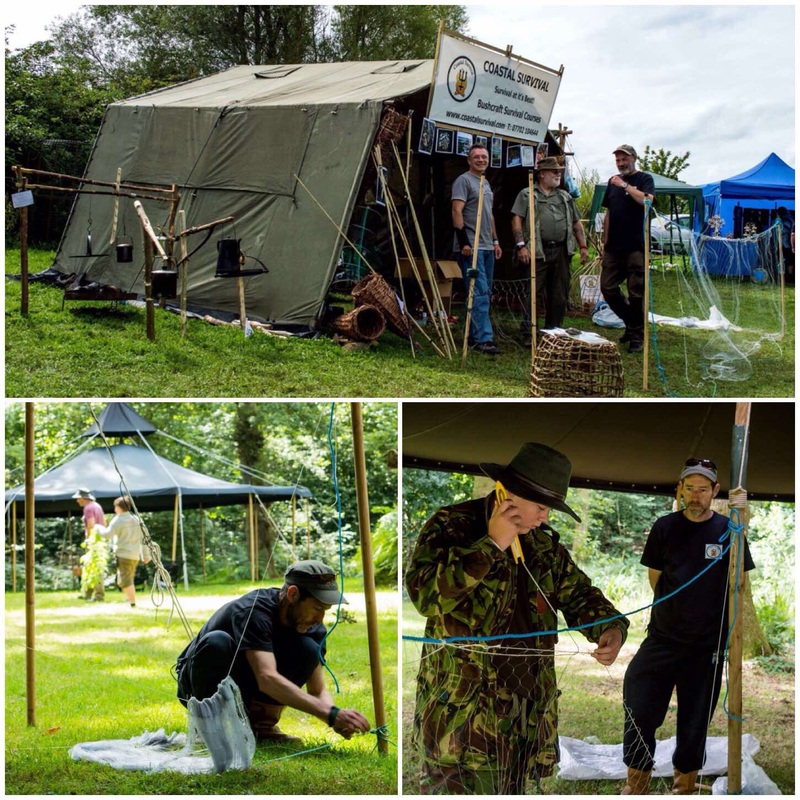 Fast becoming a regular feature at the Wilderness Gathering is the Bowdrill World Championship challenge and this year it was run by Phil Brown of Badger Bushcraft. 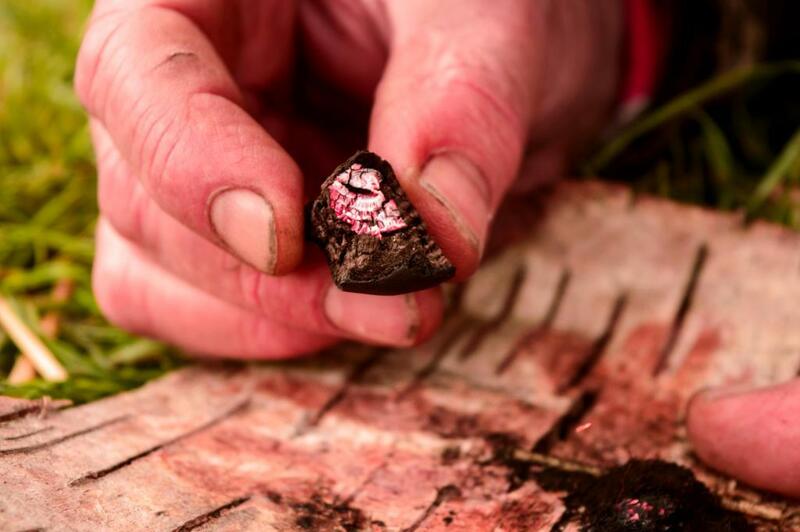 The challenge is to light a fire using a bowdrill set as quickly as possible. I have entered this on a number of occasions. My quickest time ever from start to flame is 1 minute 13 seconds, but sadly not this year. The best I could do after four attemps was 2 minutes and 6 seconds. JP won this year with a time of 1 minute 20 seconds. 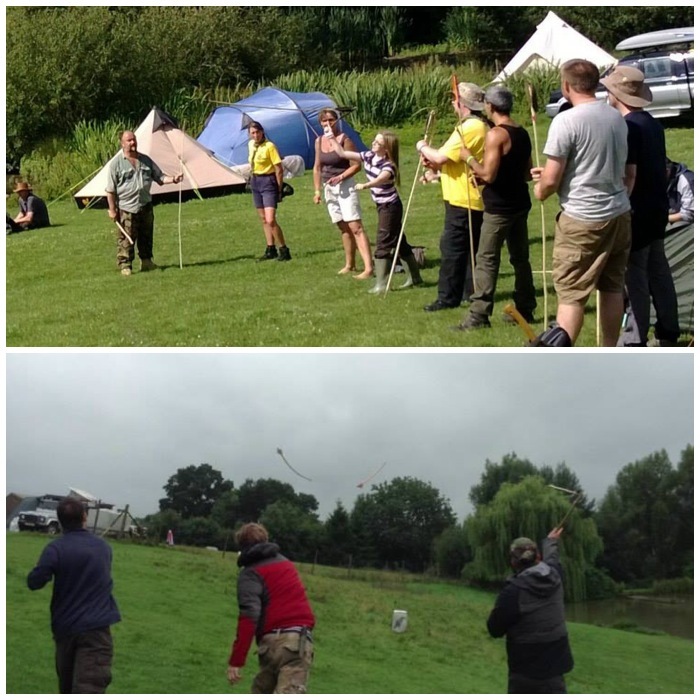 Running alongside all this competitive spirit was Jason teaching people all weekend how to use the bowdrill. 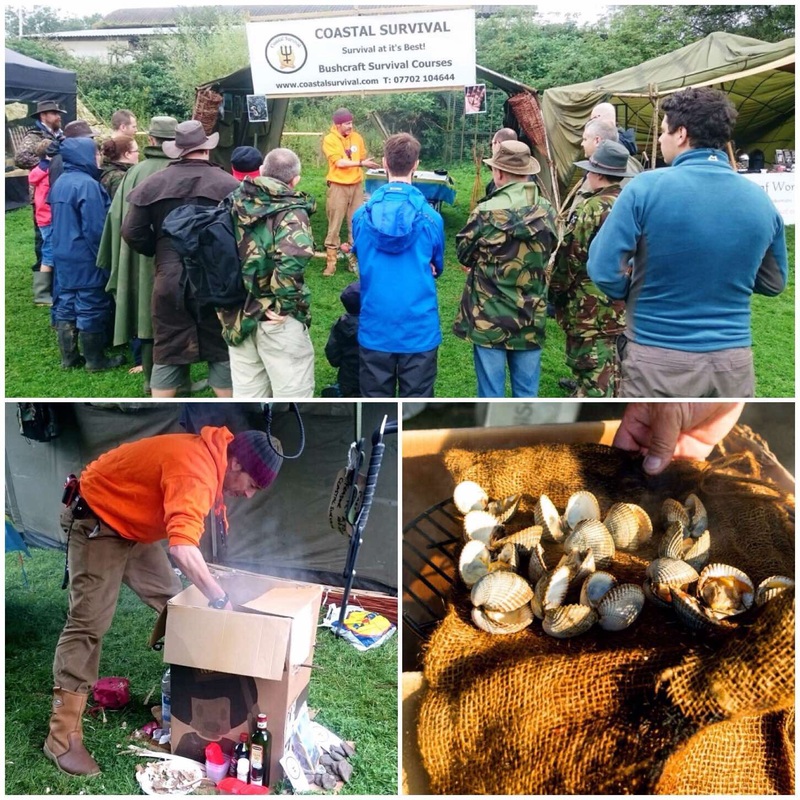 So the main job for me on the weekend was to take pictures of all the activities Coastal Survival got up to. 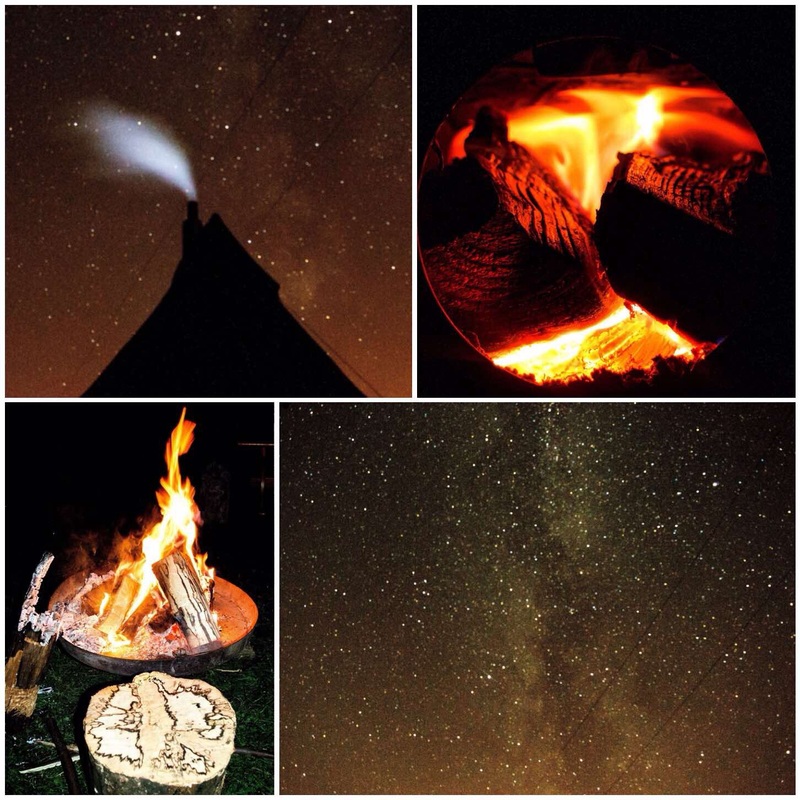 I was very happy to do this as Fraser is a good friend of mine and I am continually learning from him. 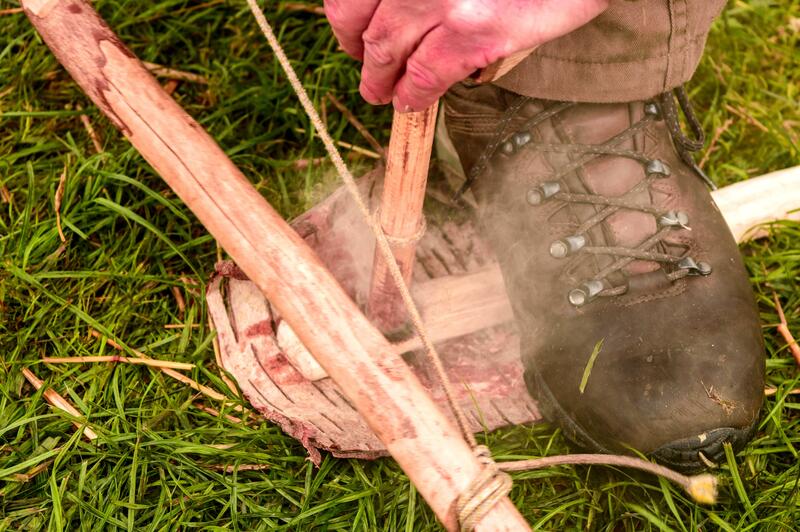 The video goes into more detail on how you make one of these very simple but effective spears for fishing. 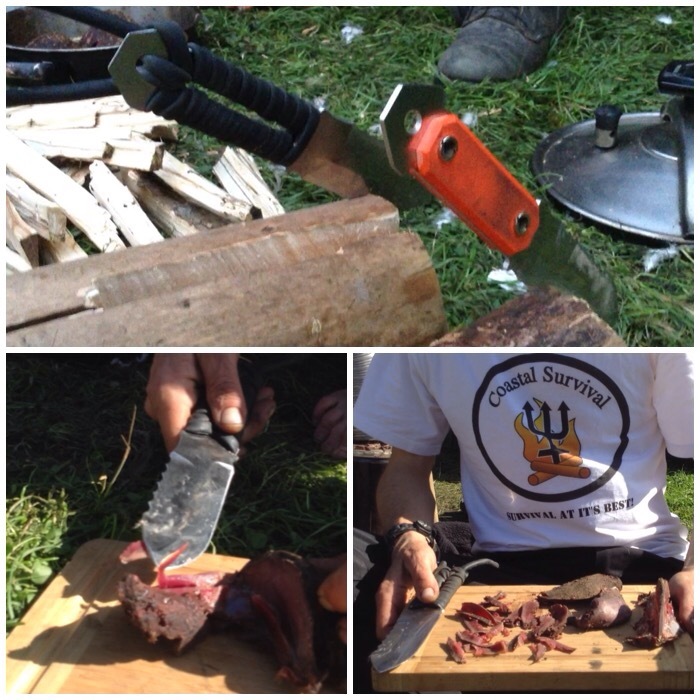 Fraser has spent time over the winter and summer developing his own knife for use in the coastal environment. It is still in its development stage but I was very impressed with its versatility and particularly liked the rubber handled model. I put together a short video showing it in use over the weekend. 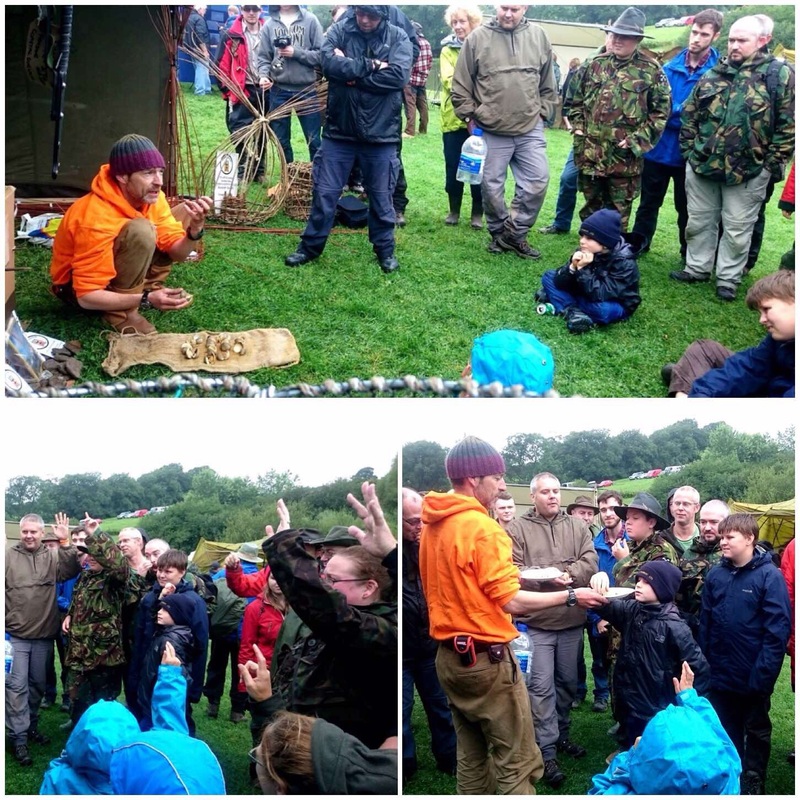 As usual the net-making classes proved very popular and Fraser and the rest of the crew ran a number of classes on making a pocket gill net and a full-sized gill net. 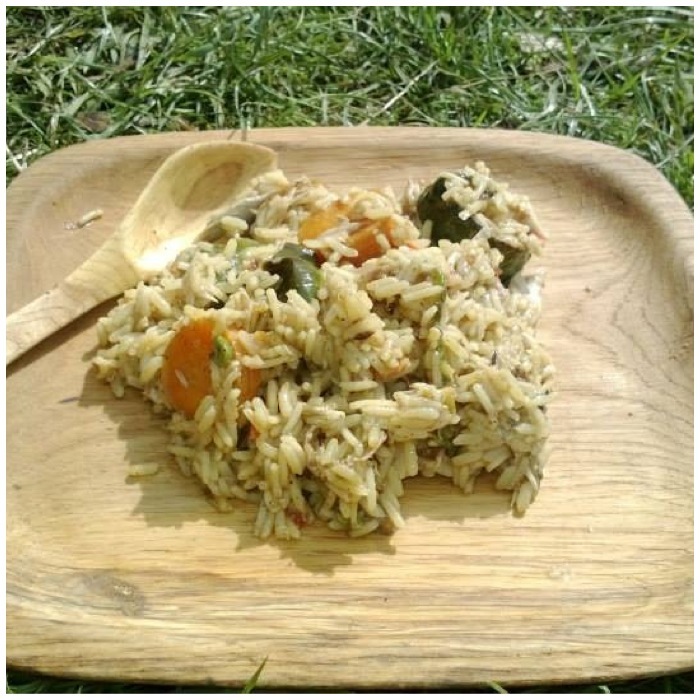 The kids particularly liked making the pocket version. 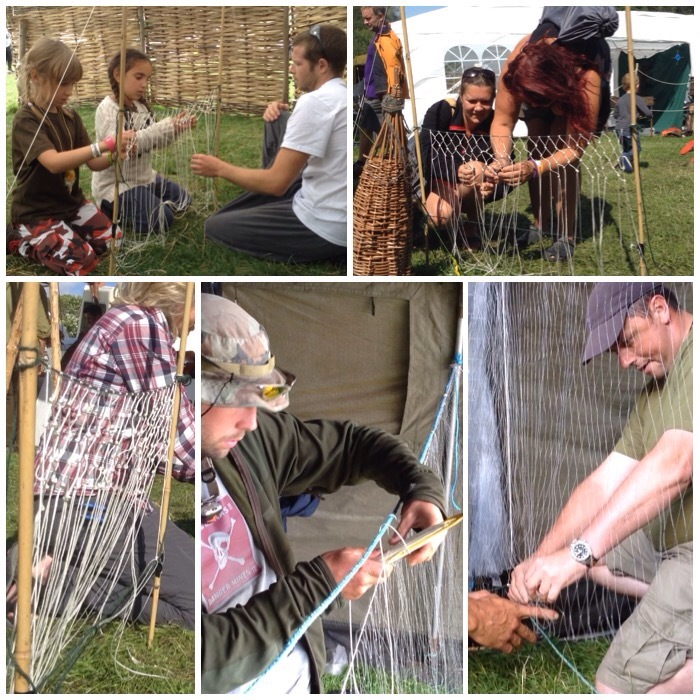 The video is not a step by step guide to making nets but it will give you a feel for their construction. 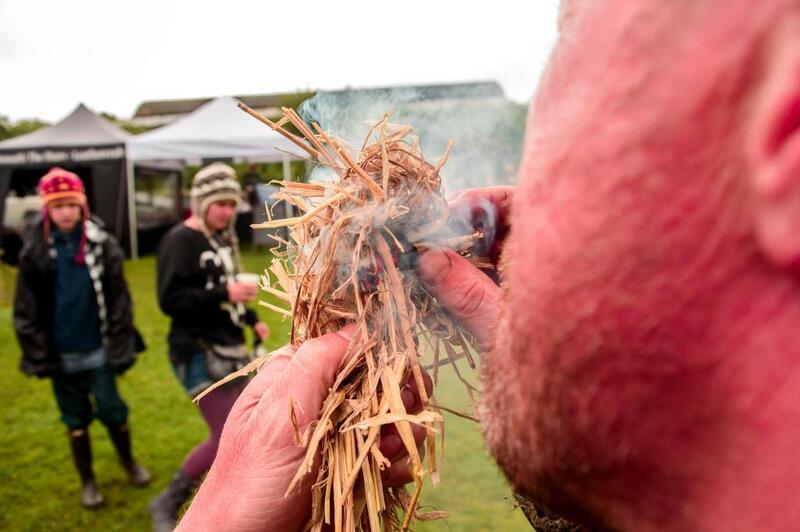 A very popular class that Fraser ran was his cold smoker class. 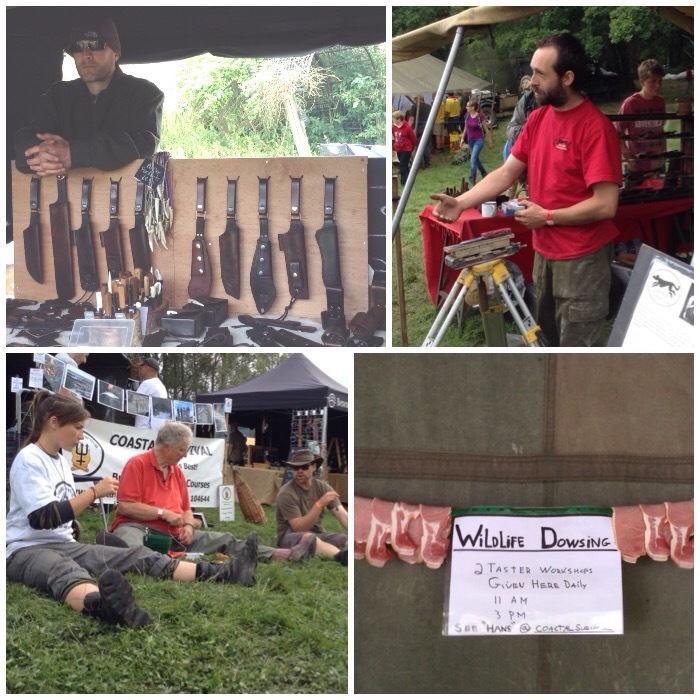 The device was set up in front of the stand all weekend and we smoked some wood pigeon in it. 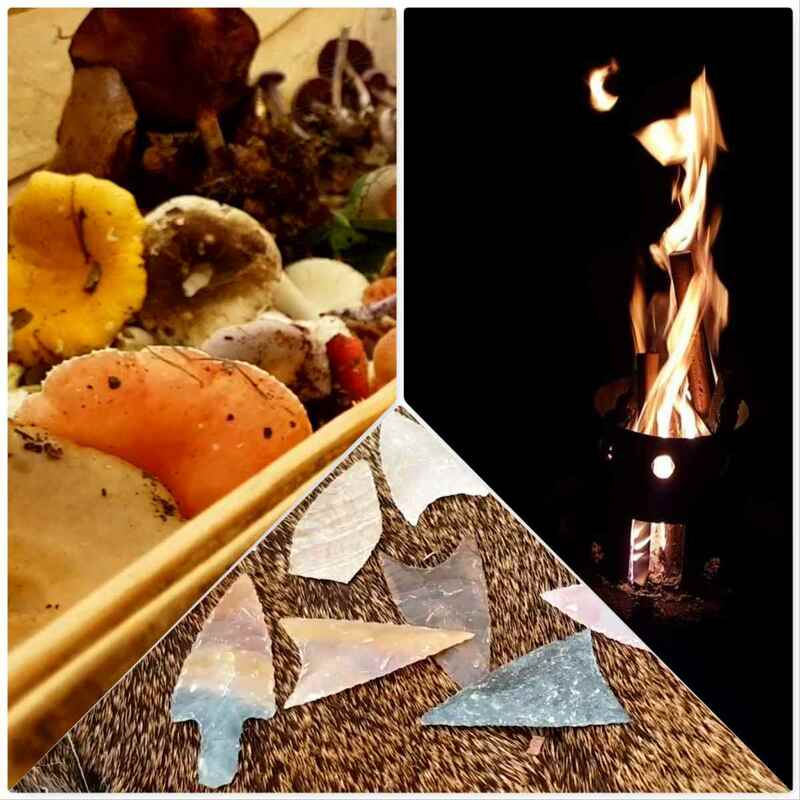 Have a look at the video and see how easy it would be to make one for yourself. 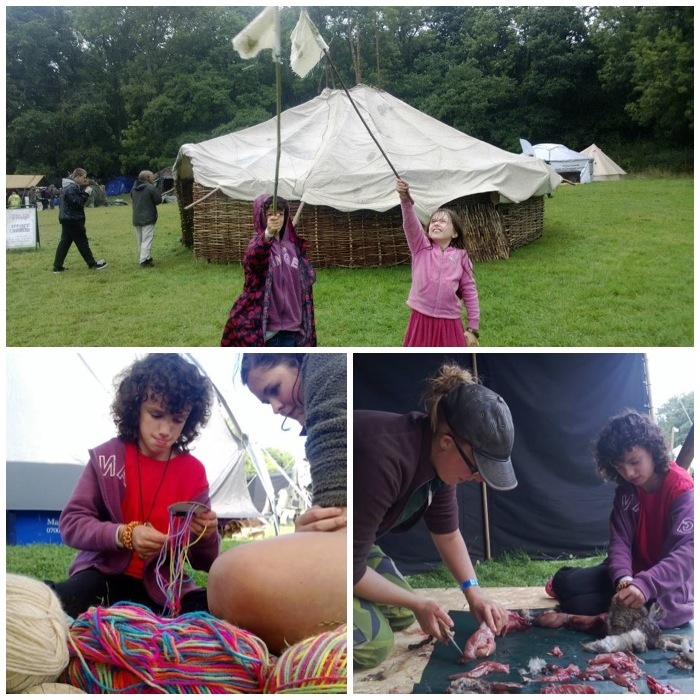 A few other snippets from the weekend: Theresa Kamper in the top right picture (below) is an expert in a lot of primitive crafts but particularly in different types of leather that primitive cultures would have used and is currently finalising her PhD in the subject. 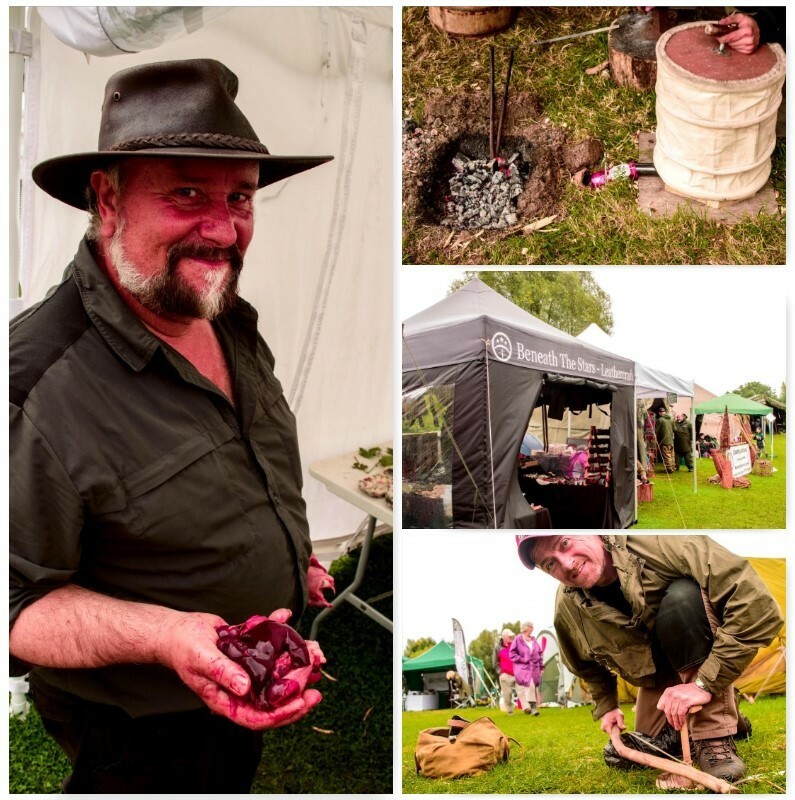 All in all I had a great weekend working hard and catching up with old friends like Sonni and Angela from Beneath the Stars Leatherworking and Dave Budd our resident expert blacksmith, and trying out new skills like dowsing with Hans. 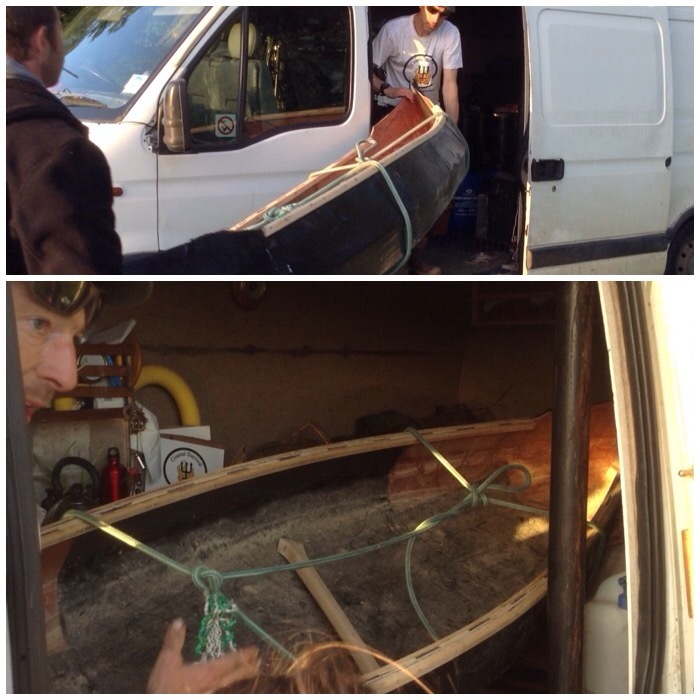 At some stage Fraser said he had been given a canoe to take away as a gift. I initially thought he was pulling my leg but it turned out to be true. I had to turn around his front passenger seat so that we could get the thing into his van but after a bit of huffing and puffing we managed it. 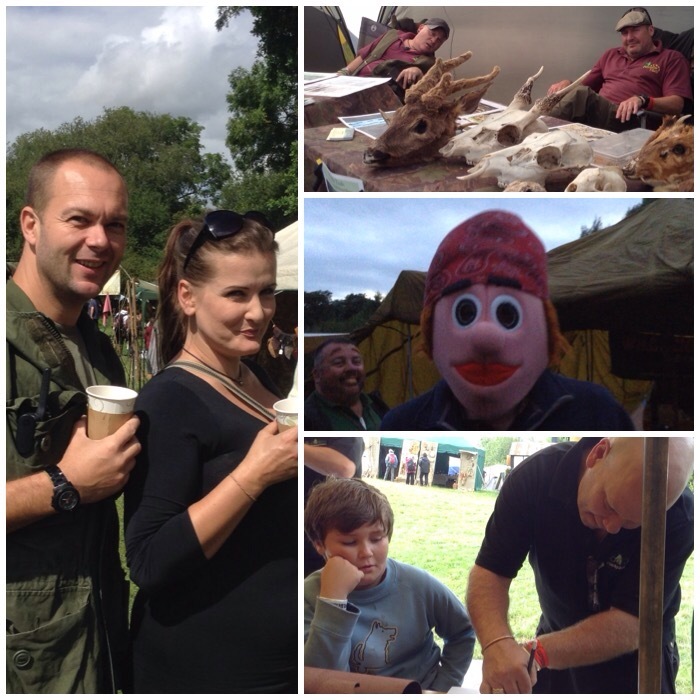 I had a fantastic weekend at the Wilderness Gathering and I was particularly happy that the filming worked out so well. Here is my last video, with shots from as much of the weekend as I could cram in. 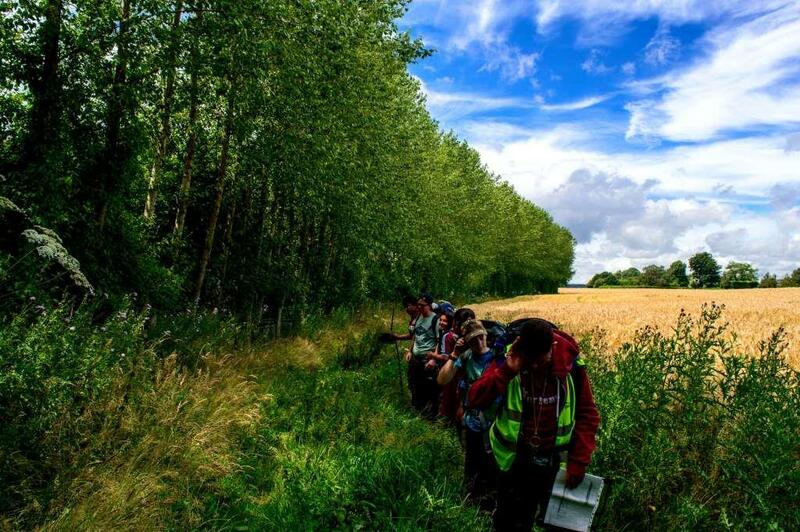 Last August found my daughter Catherine and I making our way down to the Wilderness Gathering. 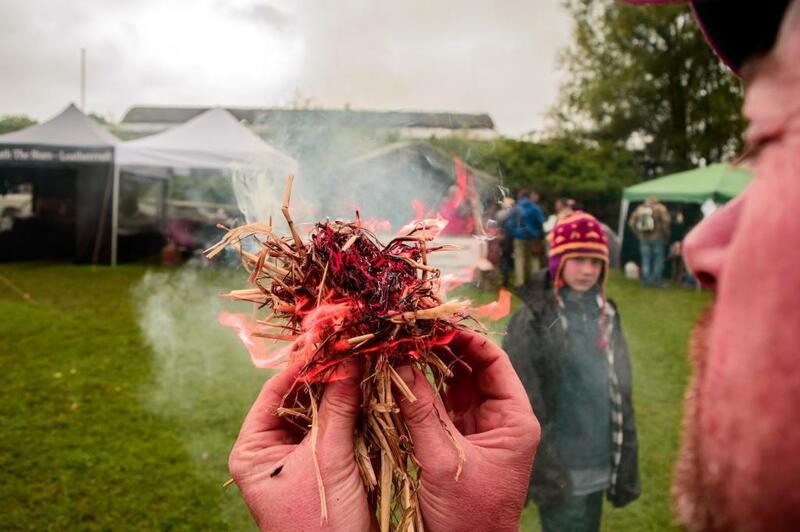 Located near West Knoyle in the beautiful South Wiltshire countryside is the Bush Farm Bison Centre. 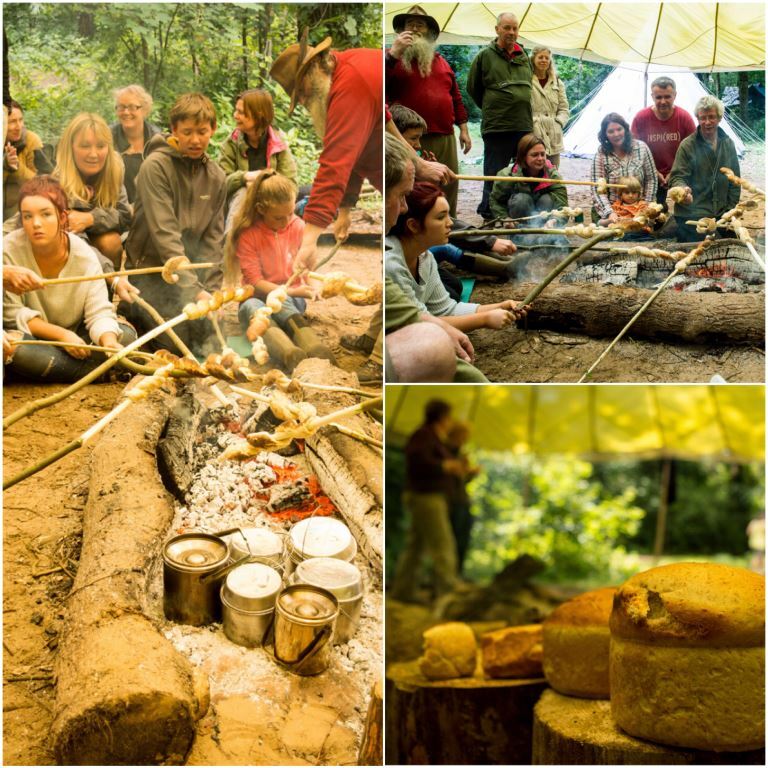 I have been visiting this gathering for the last ten years. 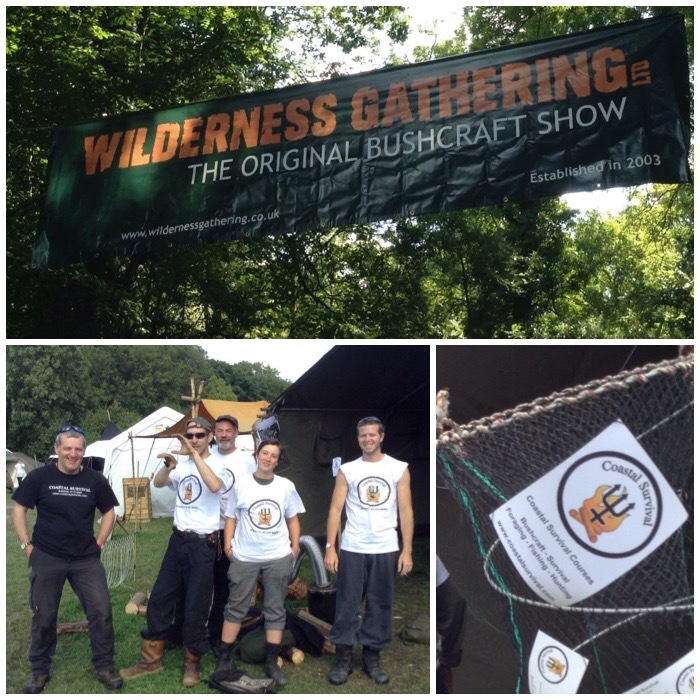 The Wilderness Gathering has a commercial feel to it though it still maintains its bushcraft origins. 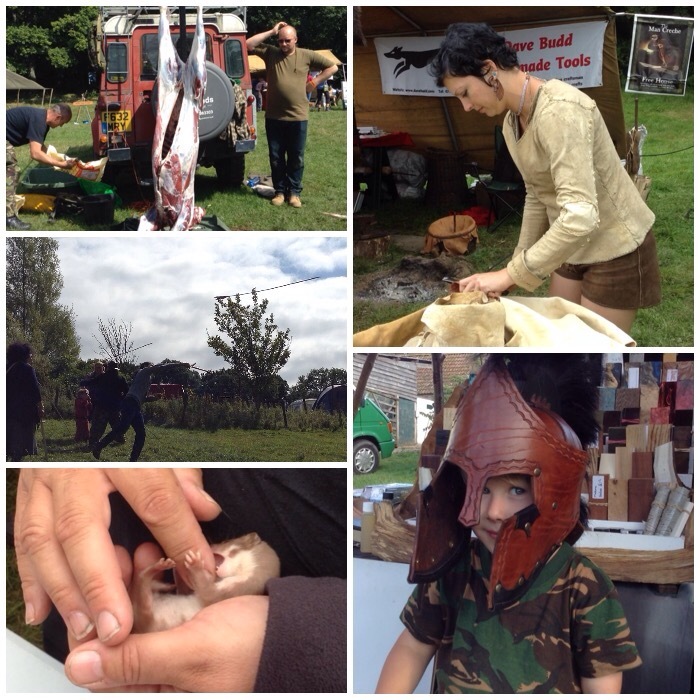 I love the fact that it is so close to where I live, there are organised classes all day for my daughter, I get to meet lots of old friends, make new ones, learn new stuff and get some more kit. 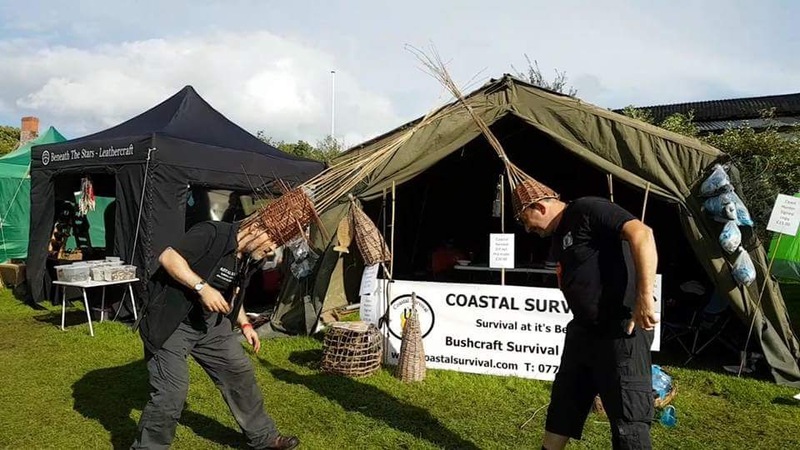 For the last two years I have been helping out Fraser Christian from Coastal Survival as he is a good friend of mine (I have added all the links at the end of the post). 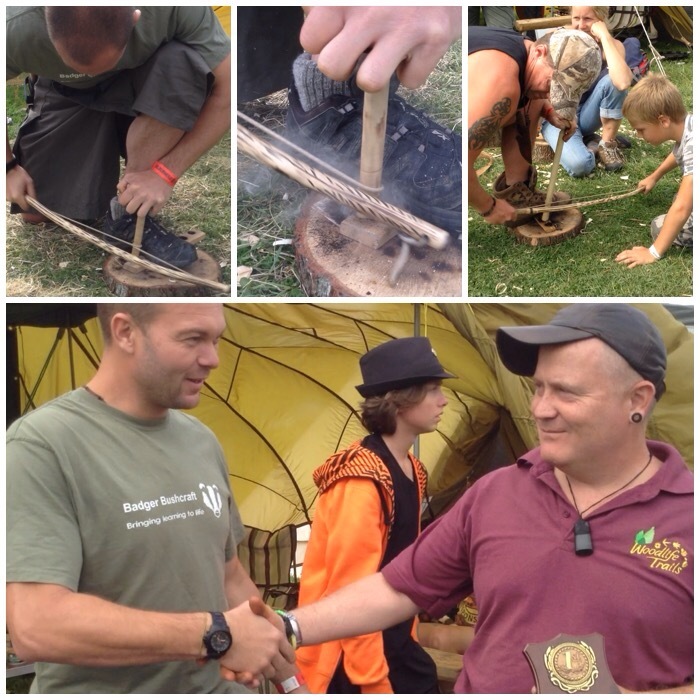 This helps me out a lot as I get a chance to learn lots of new bushcraft skills I can use with my Sea cadets. 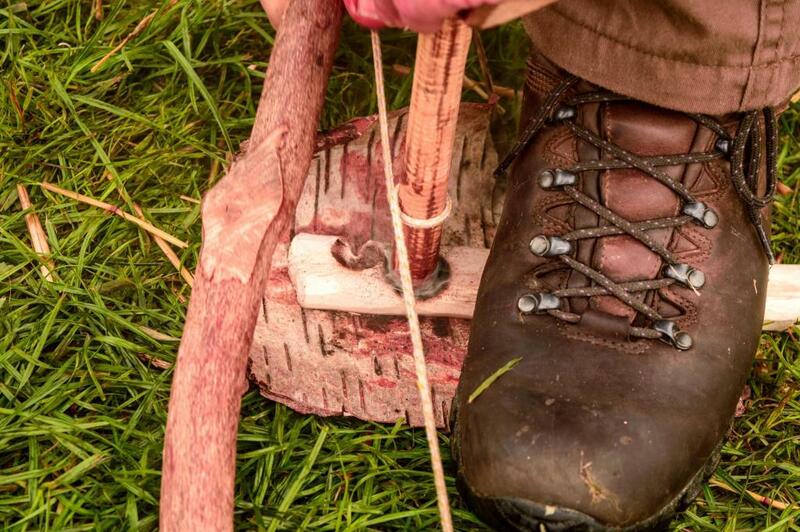 The first thing Catherine headed for on arrival was the farm shop to get some ice cream but she soon got into the bushcrafting spirit, particularly keen on doing a bit of carving (this still scares me). 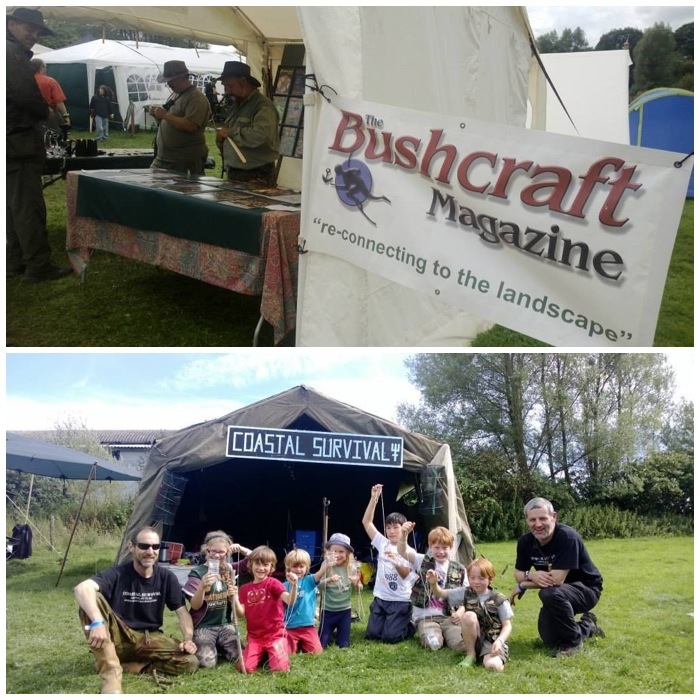 There are plenty of stalls to visit such as the Bushcraft Magazine, to chat at, to buy from and to get some great ideas. 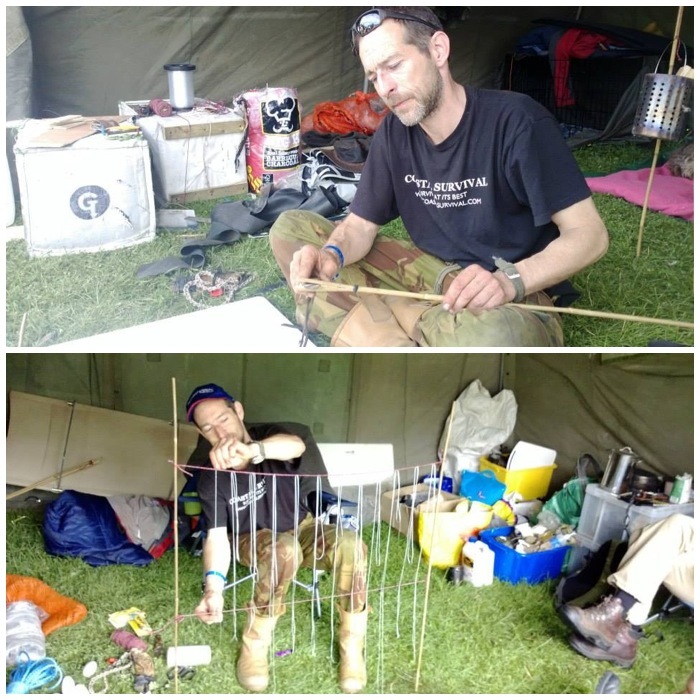 Fraser runs courses for the Coyote Kids Club such as making shrimp traps made out of recycled materials. 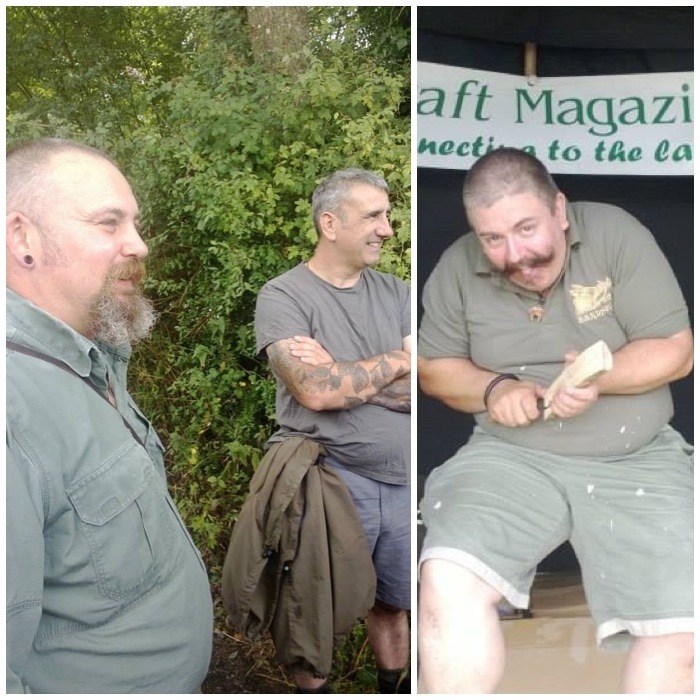 Like all the other visits I meet new friends such as the talented carver Jon Mac of Spoon Carving First Steps and good friends of old such as Phil and Ben Brown of Badger Bushcraft. 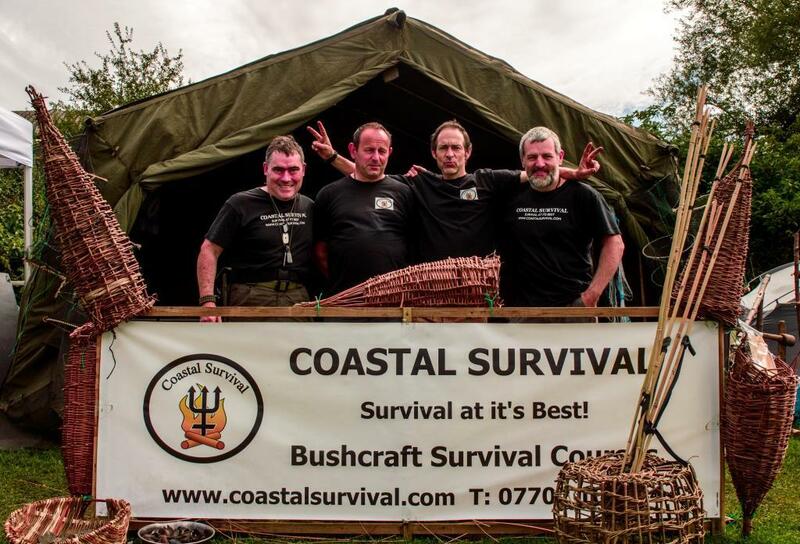 The boys from Silchester – Mark Beer (Lupus), Nick Currie and from the Bushcraft Magazine Paul Bradley. I have learnt a lot from these guys over the years. Always good to catch up, chat and share skills. Have you seen these hoodlums? 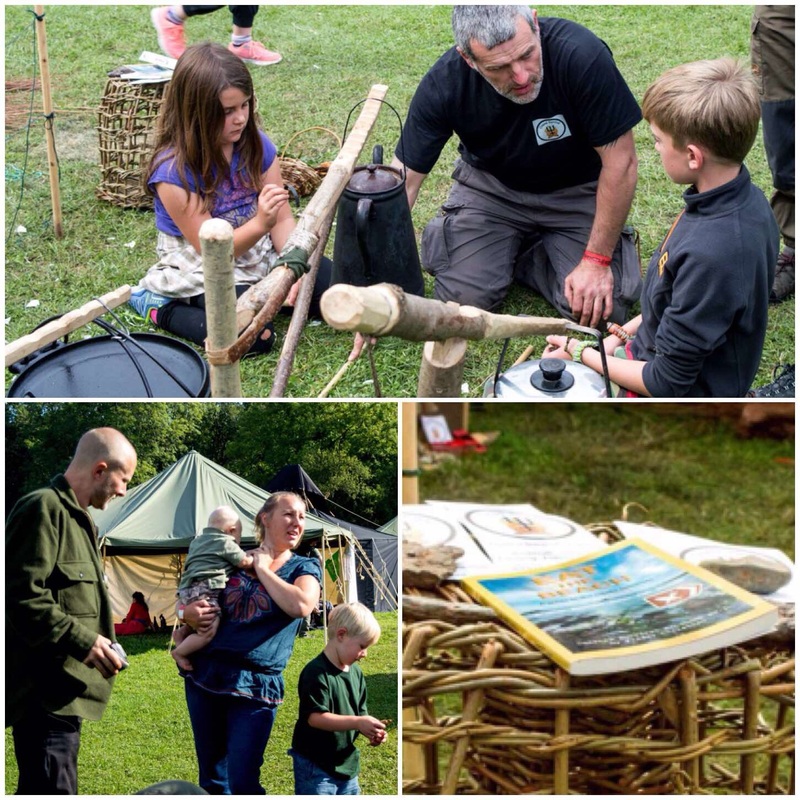 This year I helped Fraser run a course on making fishing spears and nets (well, took a lot of pictures really). 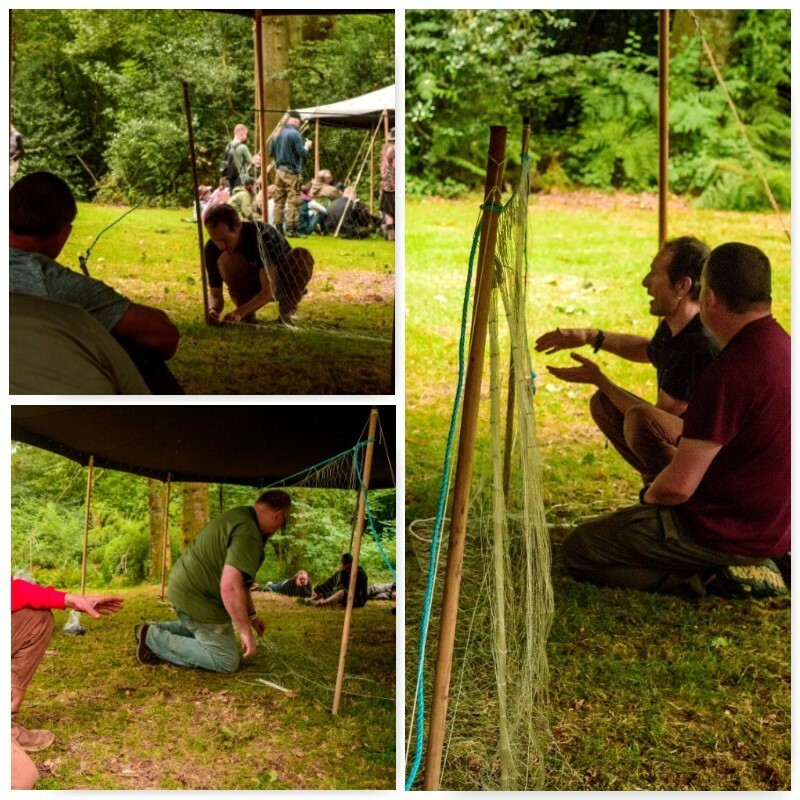 The fish spears are easy to make and the net making was run as a Masterclass. 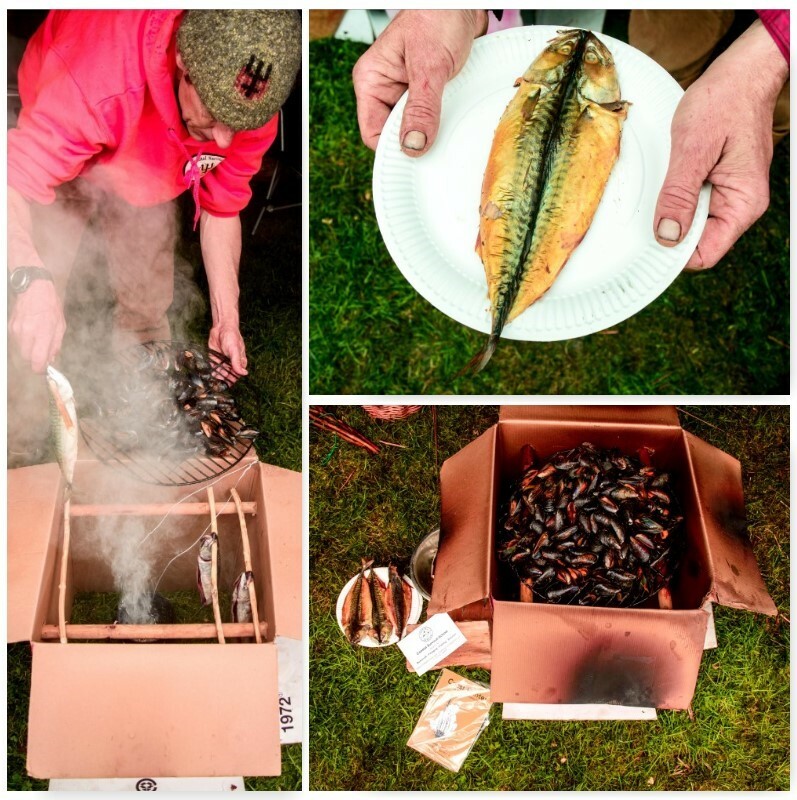 A very popular class Fraser ran was how to cold smoke a fish in a cardboard box. 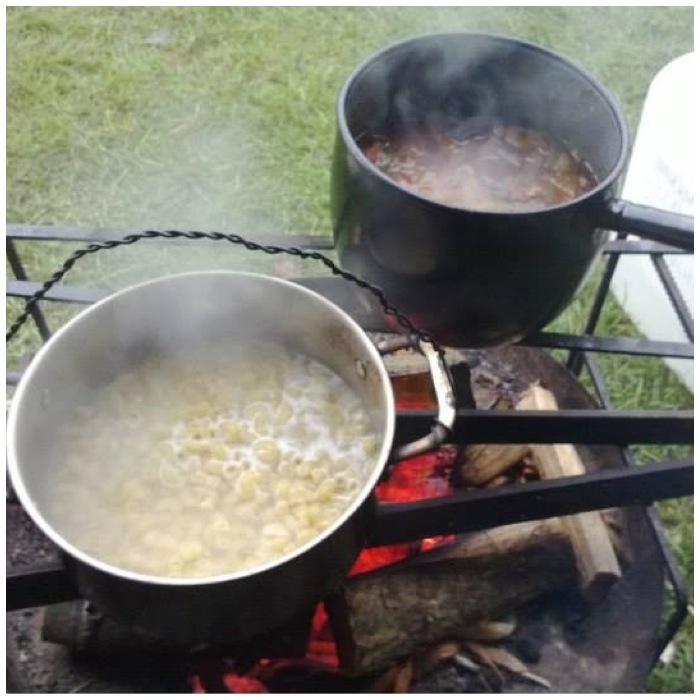 Due to the damp weather the smudge fire kept going out but after a few hours we managed to smoke the fish and it was added to an excellent stew. 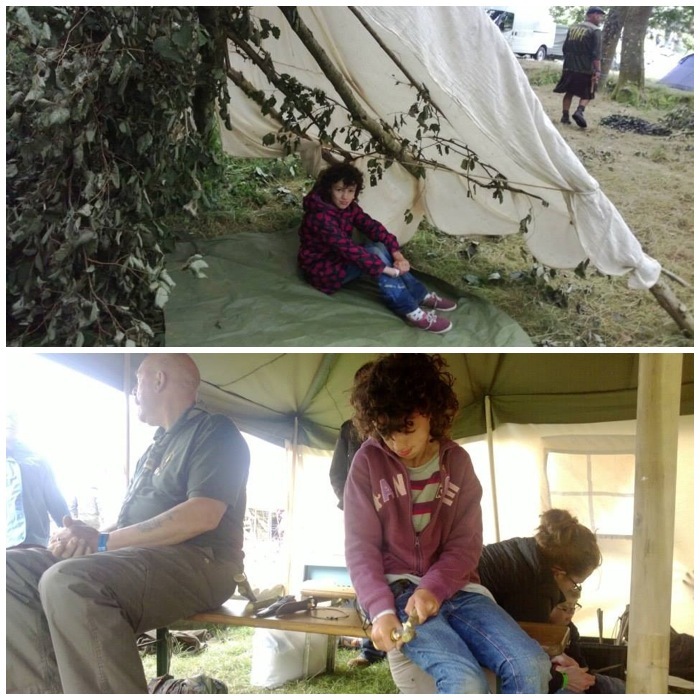 My daughter Catherine always has a great time at the Gathering as there is plenty for her to do with the Coyote Kids while I am working. 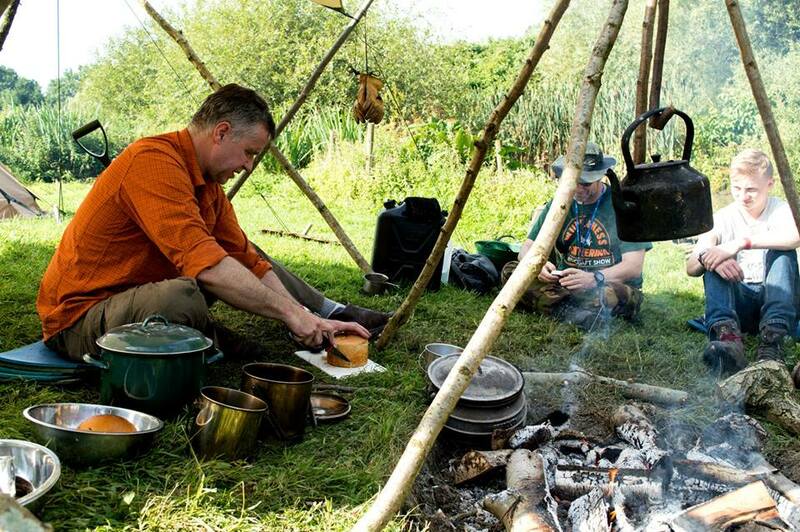 As per usual the food is good with Fraser cooking. 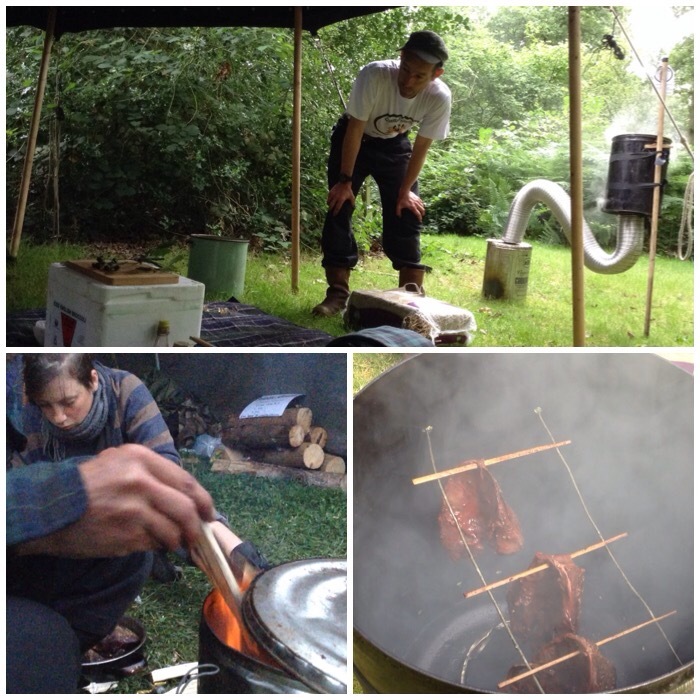 I was trying out a new set up here on my fire pit using racks set at different heights for cooking different foods. 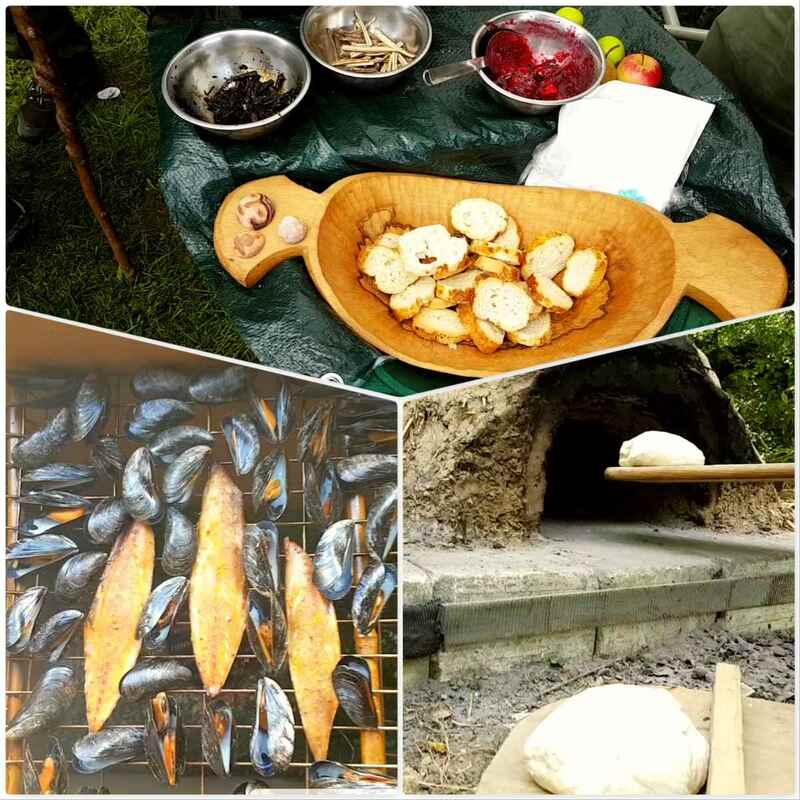 No big meals this time as we were kept too busy with classes but excellent all the same. 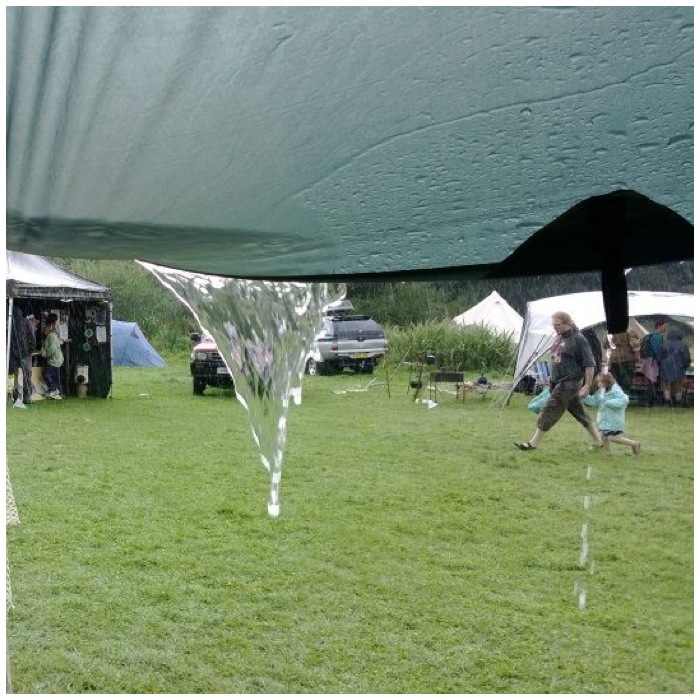 Caught this shot in one of the many showers this year, thankfully though most people just shrugged the rain off and got on with things. 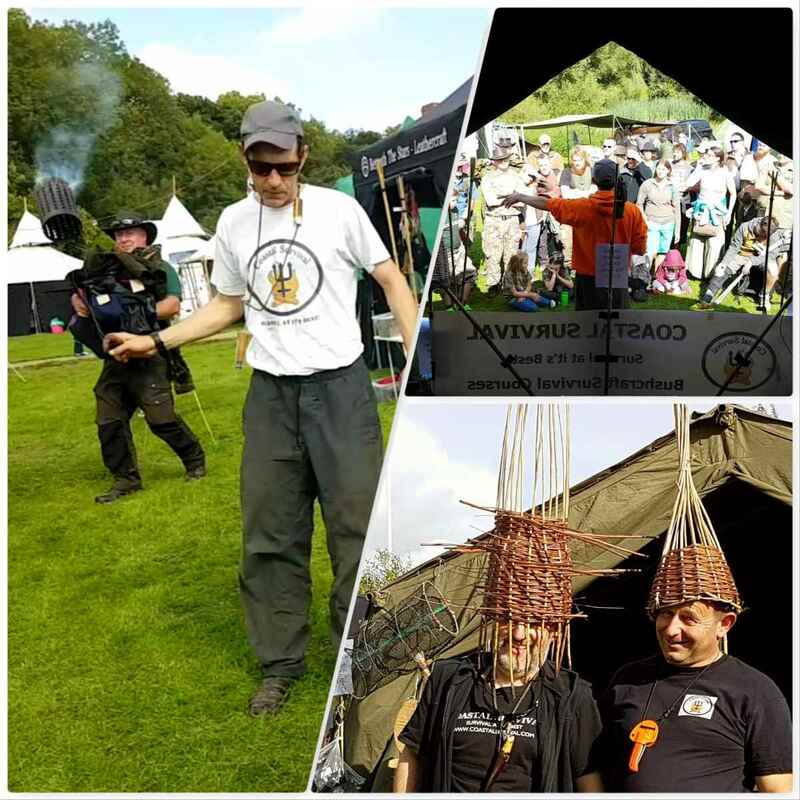 Over the road from our stand was my friend Jason Sears teaching some group bowdrill. Every time he got the sets out he always had a good audience as folk knew they could participate. 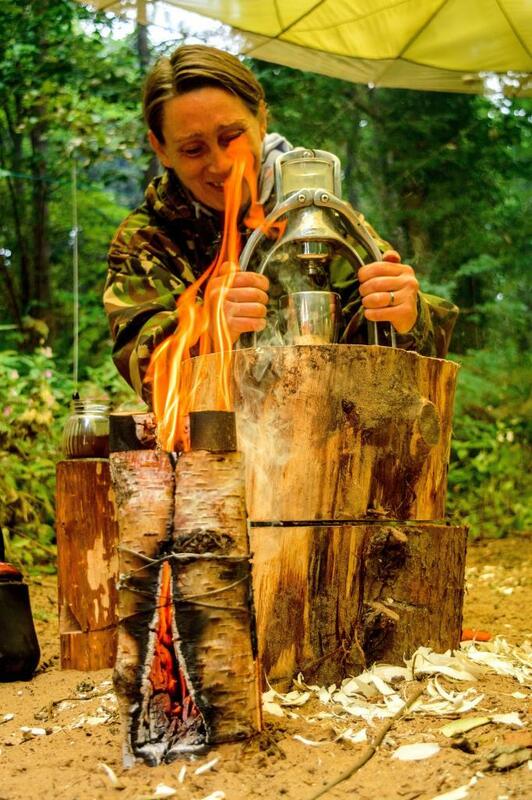 Rain was no barrier to this bushcrafter when it came to lighting a fire. 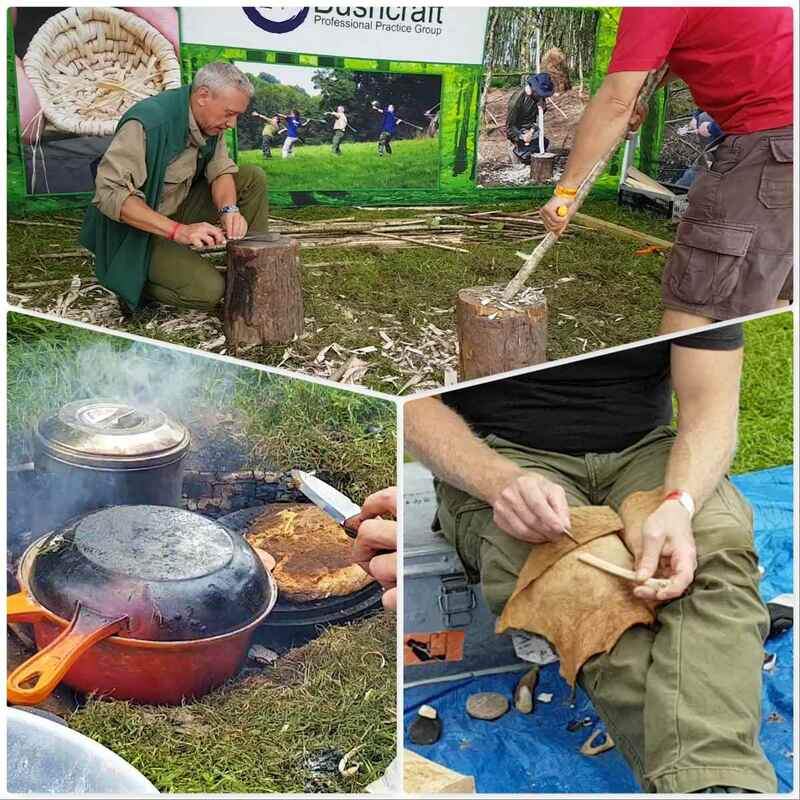 Other neighbours included Ben Orford demonstrating great green woodworking skills and JP from Woodlife Trails expertly taking the visitors through all the steps of creating fire by friction. 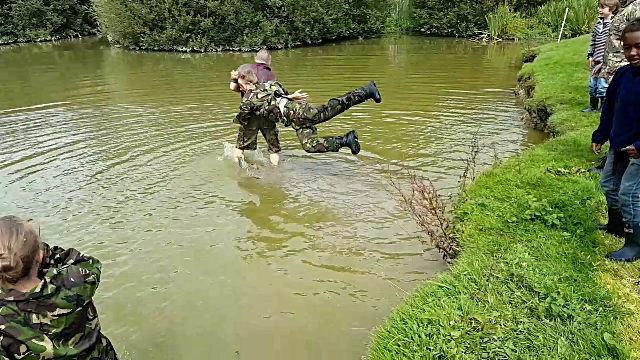 I try and get Catherine involved in as many activities as possible. She jumped at the chance to be a Pump Monkey for Dave Budd while he created some knives. 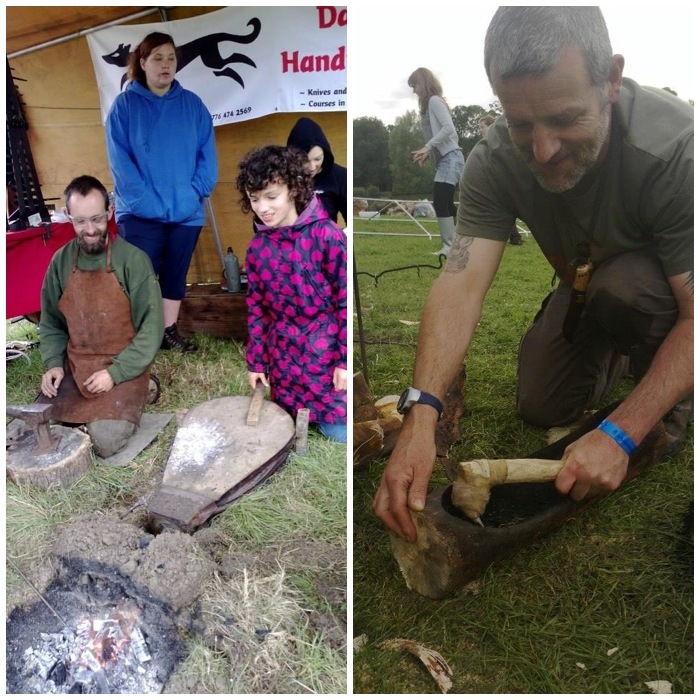 I also got a present from my friend Stephen Herries of a burnt-out log – he claims I stole it off him 😉 – which gave me a chance to get my flint adze out and do a bit of primitive carving. The log is a rather nice long bowl now. 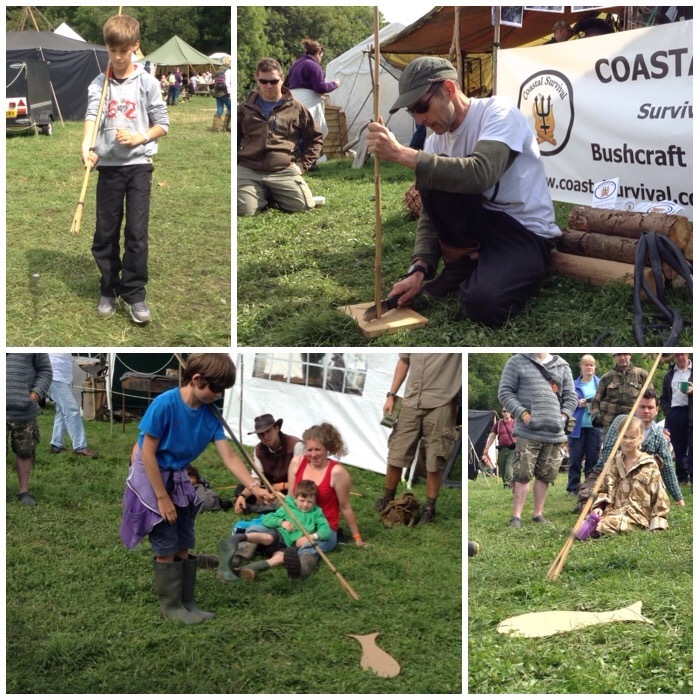 Steve Kirk of the Bushcraft Magazine ran an Atlatl making class this year which proved very popular. 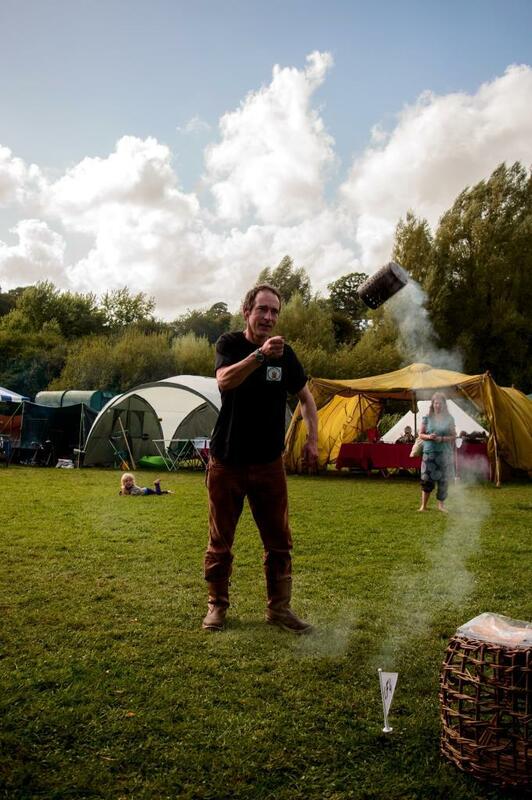 I learnt this skill at the gathering 10 years ago and have taught it to hundreds of people since then. The shooting of these darts make for some great pictures. 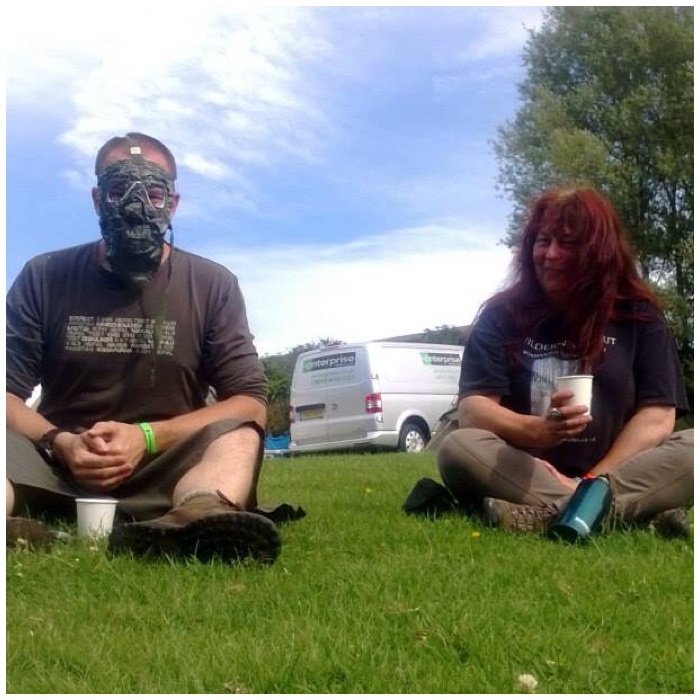 I don’t know what Sarah (of Wilderness Spirit) thought when the Gimp appeared one afternoon – he is harmless really :-). Catherine was very chuffed to meet her friend Molly again this year. I think that Catherine will be able to turn her hand to many things as she grows up based on these pictures. 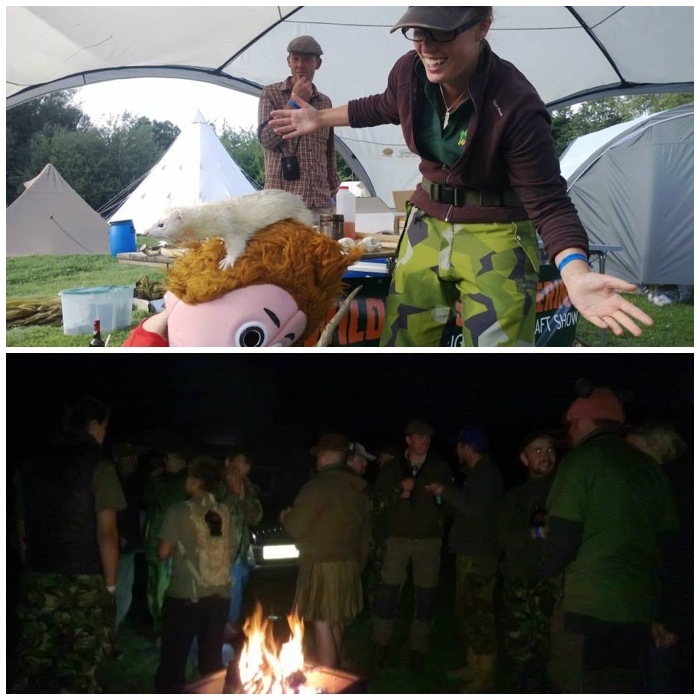 At the end of the Gathering I had a great evening with the guys from the Tribe watching Billy the Bushcrafter (Catherine really) being set upon by Beccy’s little ferret. 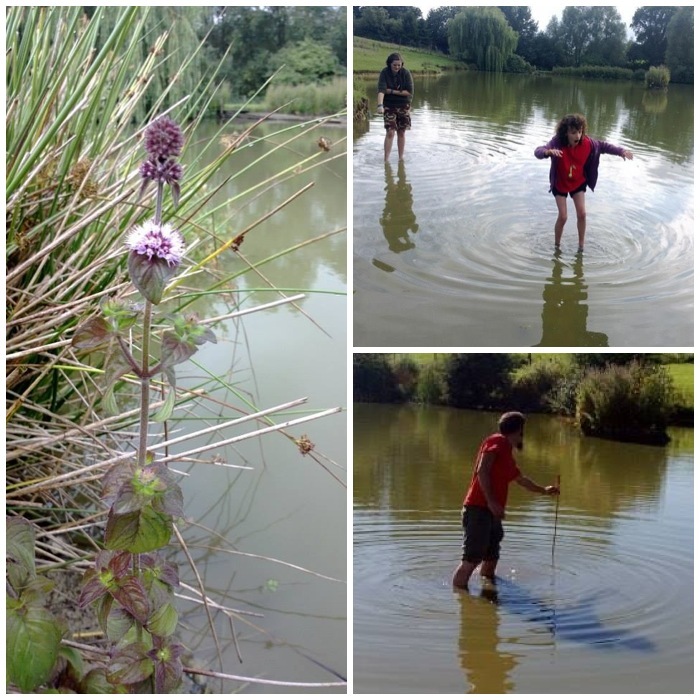 Last but certainly not least is the pond in the centre of the farm. This is one of my favourite places, I have spent many a relaxed hour sitting beside it. 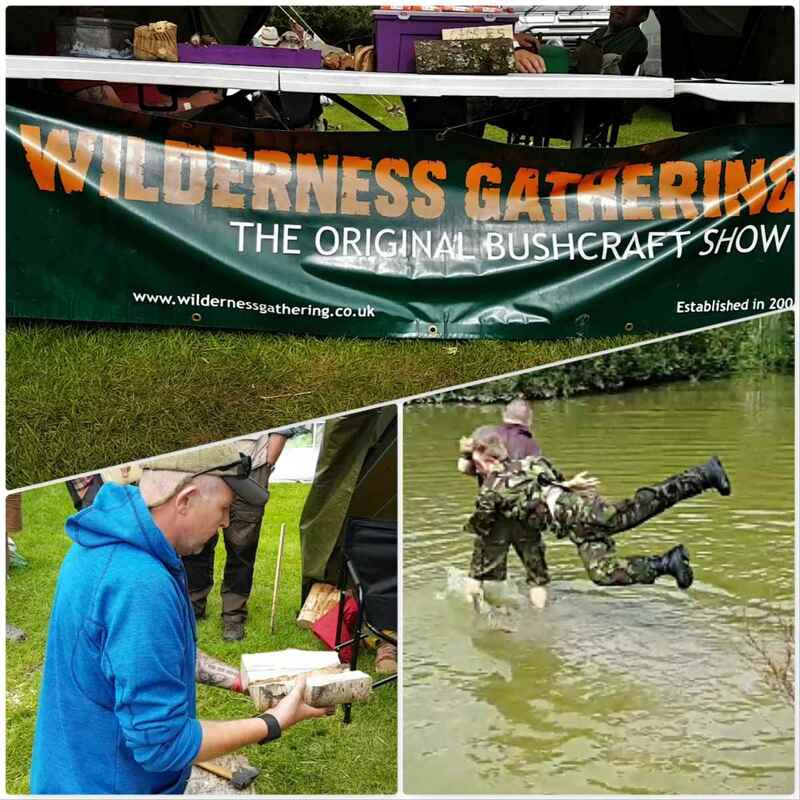 There is much more to the Wilderness Gathering than the few pictures I took last year so check out some of the links I have put below. 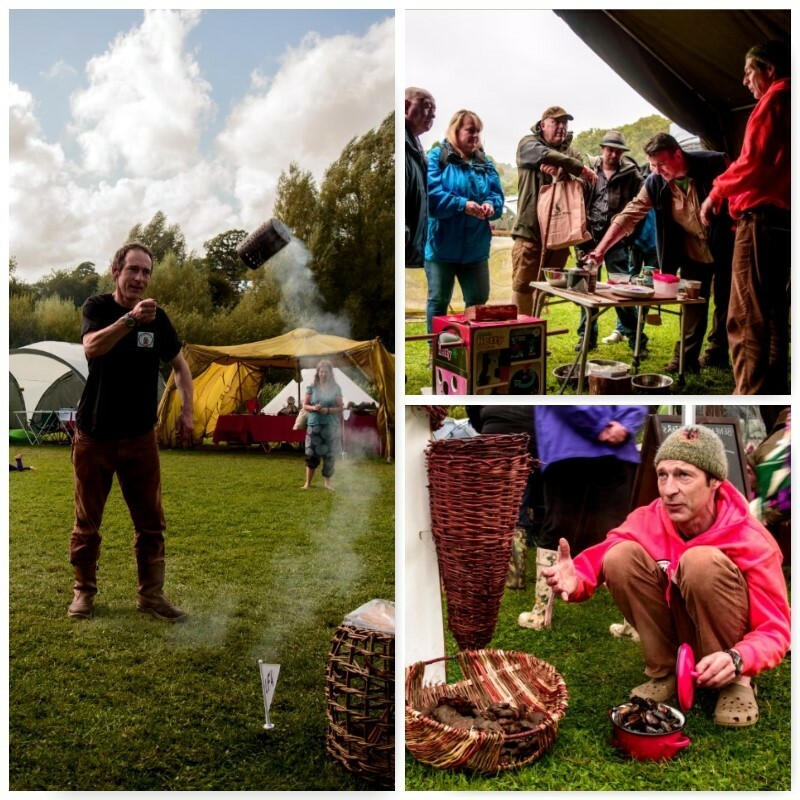 I am looking forward to this year’s Wilderness Gathering and catching up with everyone again.